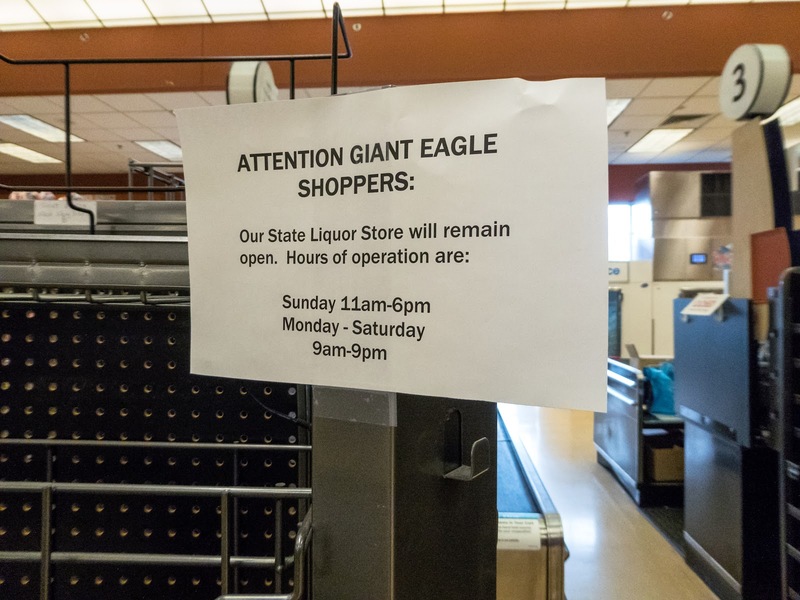 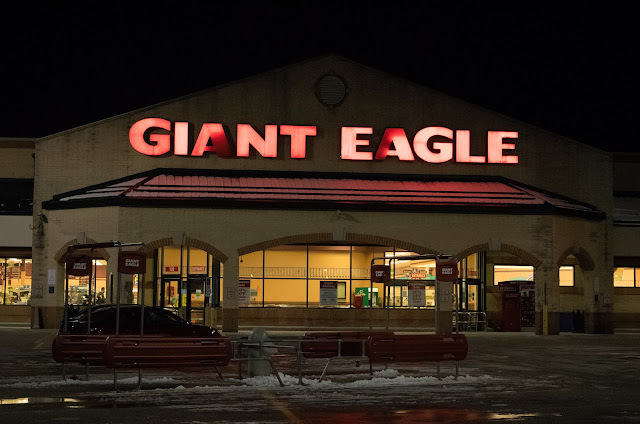 Thanks for the information about Giant Eagle. 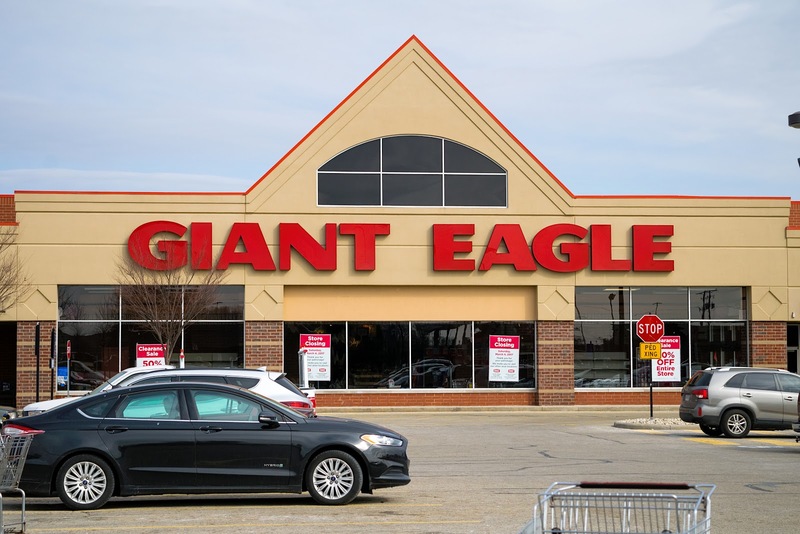 It's one of those major regional chains that those of us who live outside their region know little about even though we've heard the name. 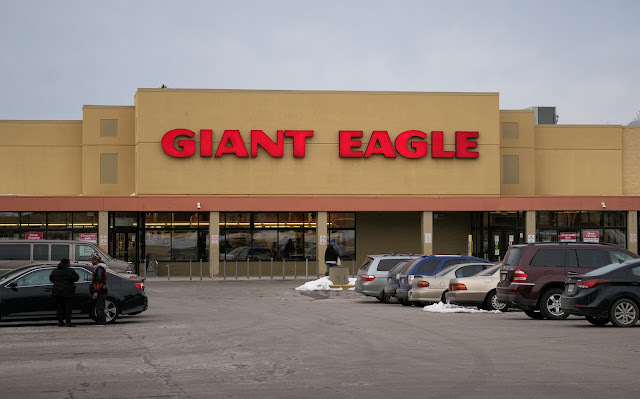 I actually shopped at a Giant Eagle in Akron near the Summit Mall some years ago. 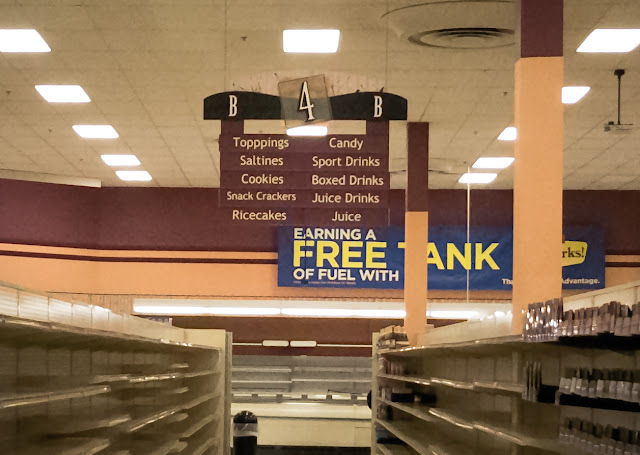 It seemed like a nice store, but I think I had a preference for the Acme Fresh Market across the street. I can't really remember why I had a preference for the Acme Fresh Market, but is that a common opinion for people living in the Akron area? Thanks for the pictures as well. 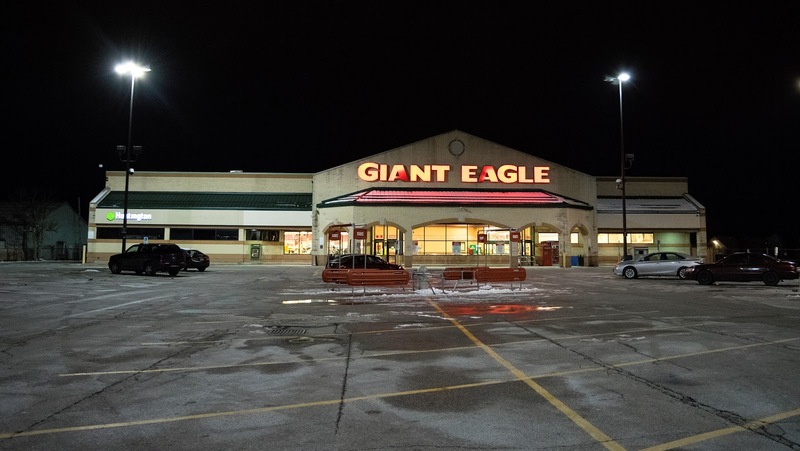 The Lorain Avenue store is the most interesting one to me. 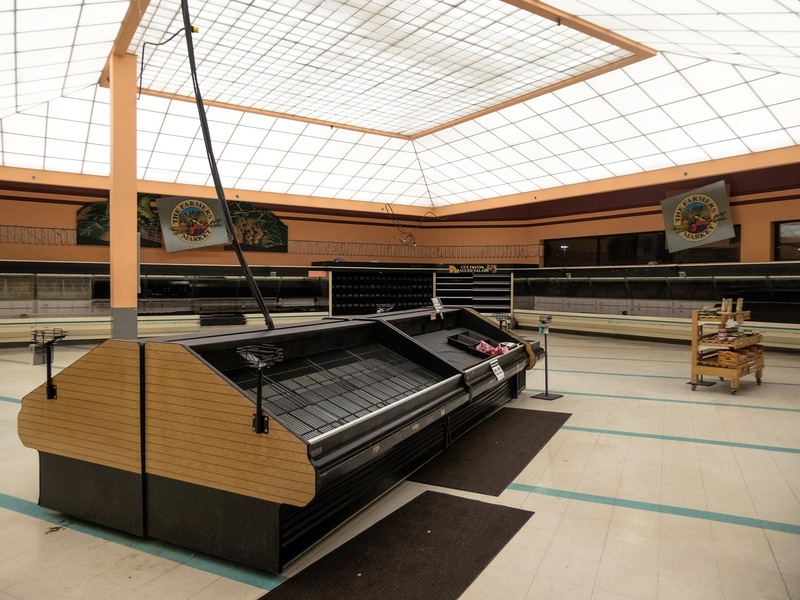 You say it opened in the mid-1990s according to your research (which I don't doubt), but it really looks like something that would have opened in the late 1980s. 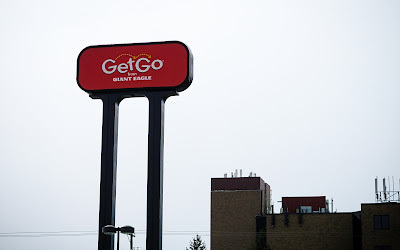 Perhaps Rini-Rego was still using some retro designs at that time. The lighting in the produce area is really remarkable and must have been quite a sight to shoppers when they first shopped at that store. 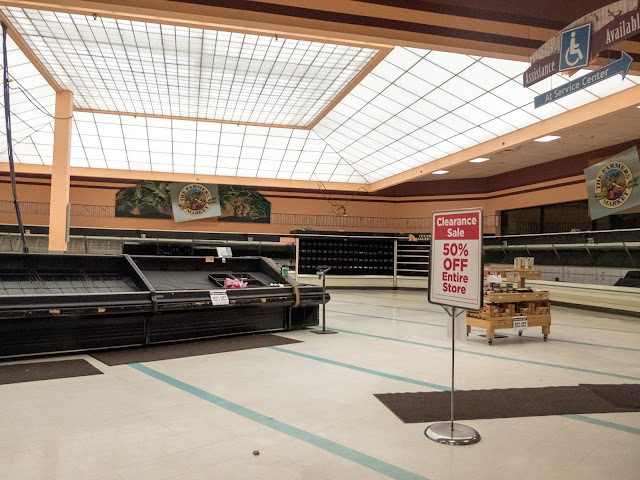 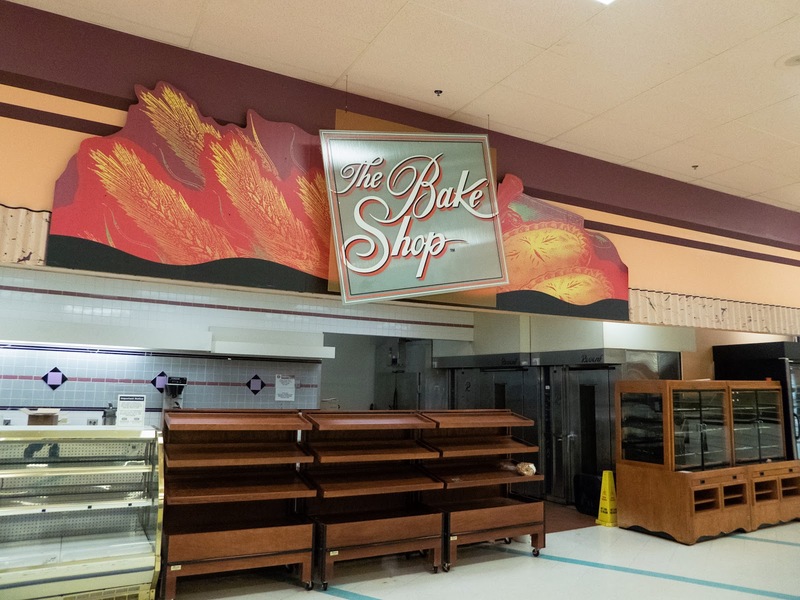 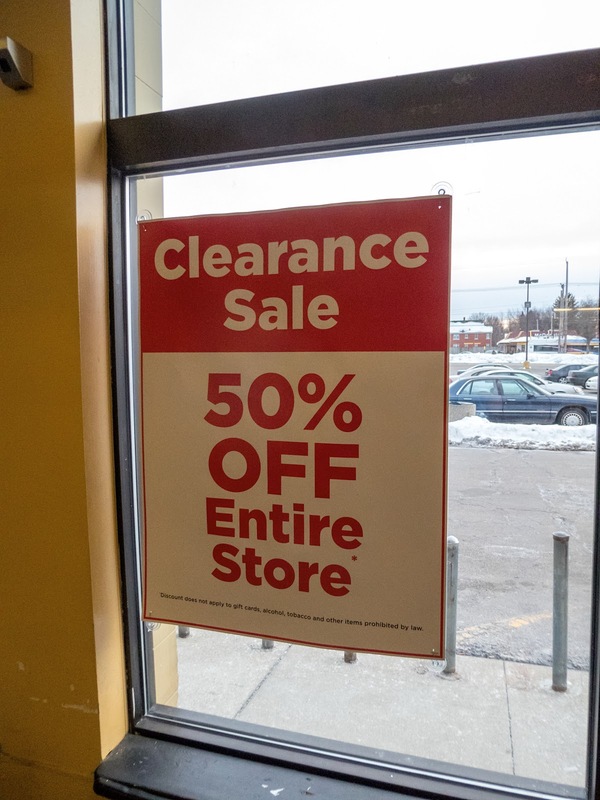 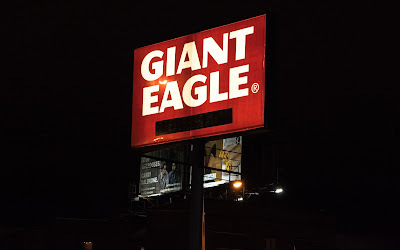 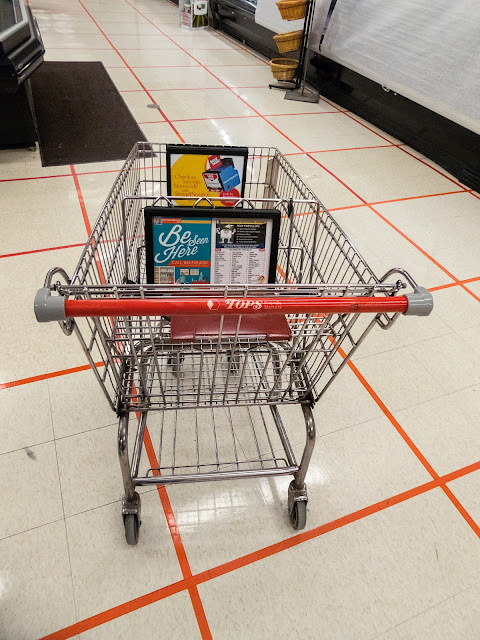 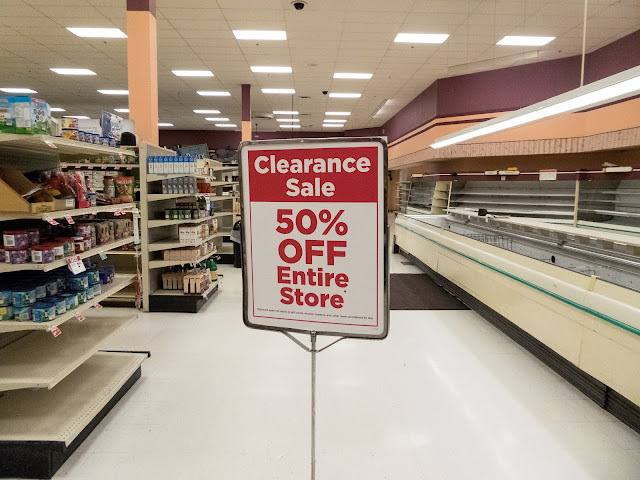 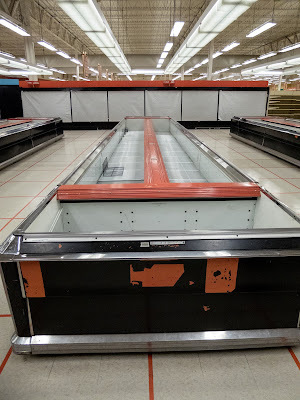 A design like that would look much less remarkable once a bulb or two burned out, but it looks like Giant Eagle maintained this store well on the inside even though it was destined to close. 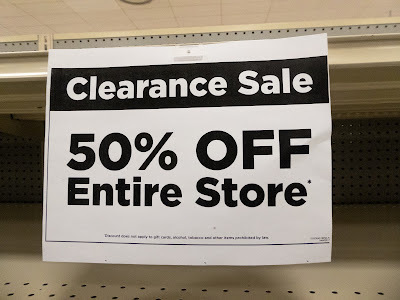 It's sad that this store is closing as it seems like an interesting place to shop. 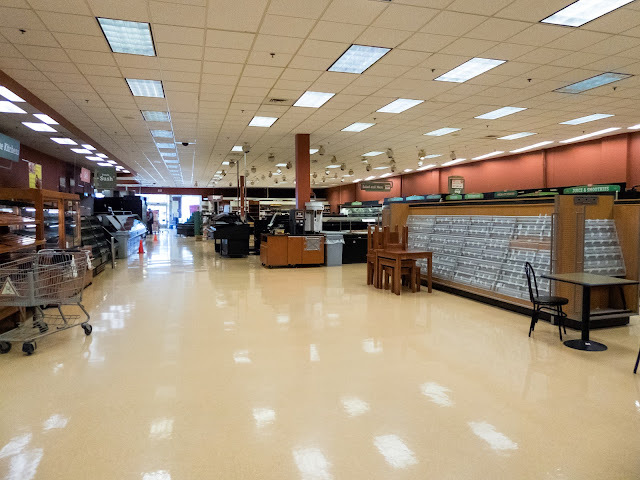 I think people generally do like Acme Fresh Market better. 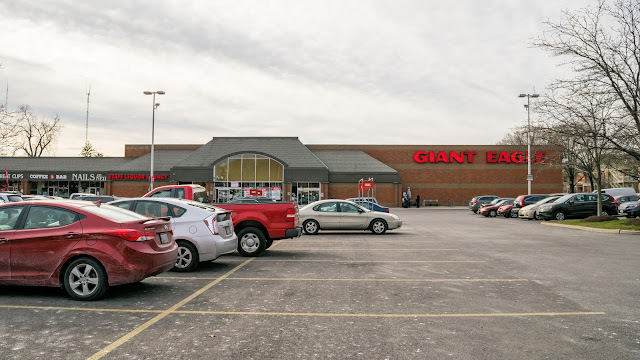 I live closer to Cleveland and have never shopped at an Acme store before, but I generally do hear more positive things about them. 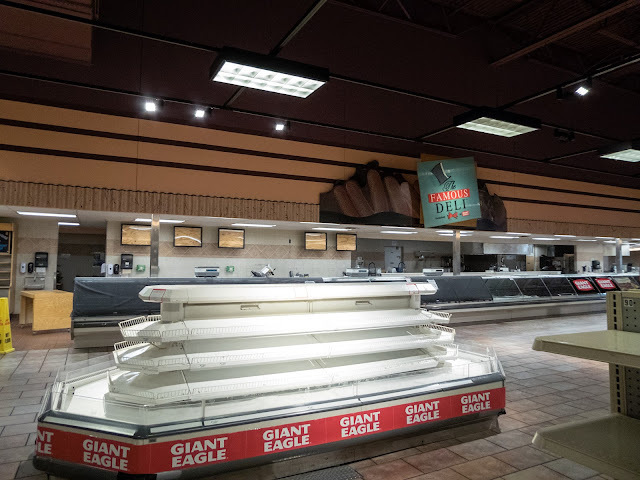 I hear that people complain about some Giant Eagle stores not being updated, problems with produce, and problems with customer service. I also think a little bit of Pittsburgh / Cleveland rivalry plays into some customer opinions about the store. Chains such as Acme Fresh Market, Buehler's, Heinen's, Marc's, Fishers Foods, and Dave's are all more local chains based in Northeastern Ohio so they do get some home turf advantage over Giant Eagle. 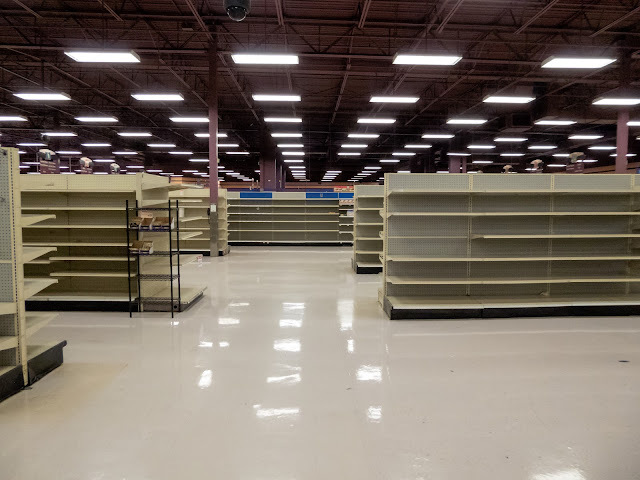 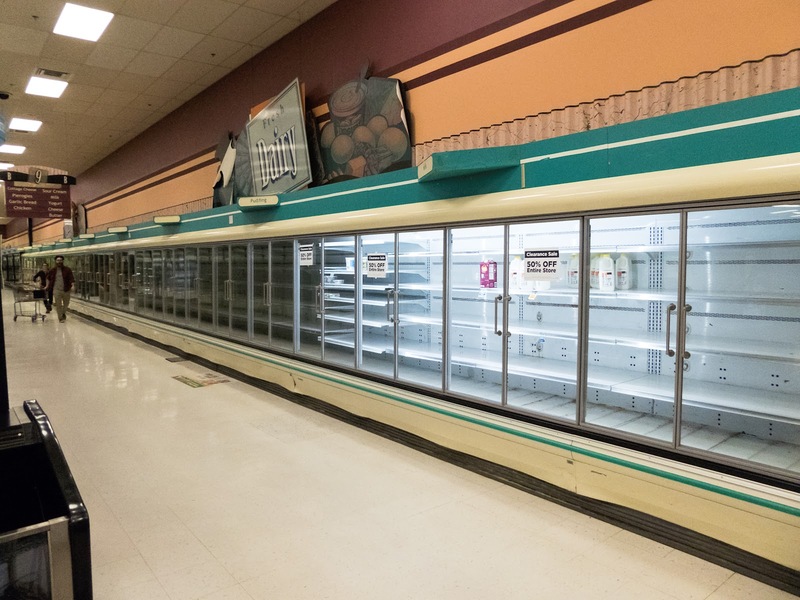 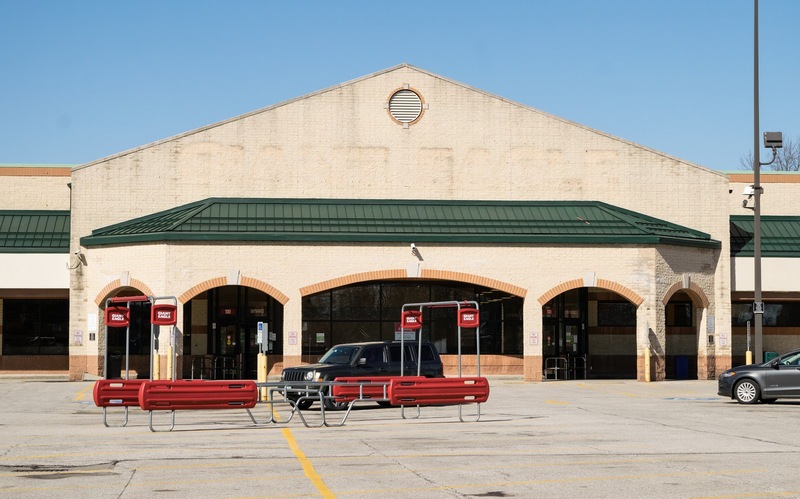 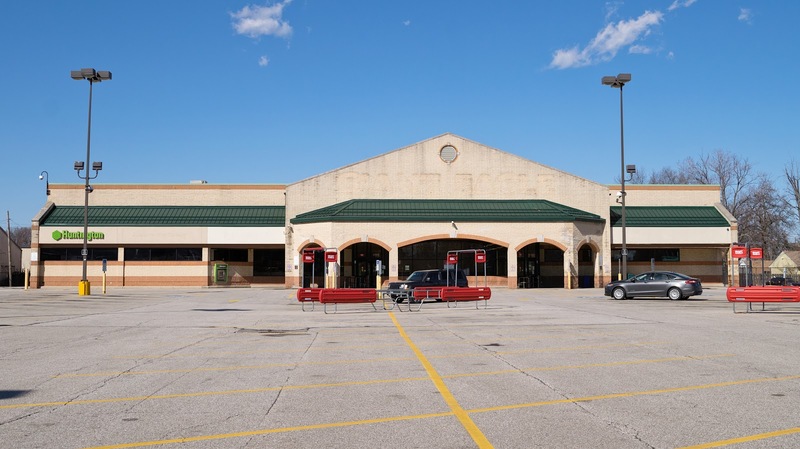 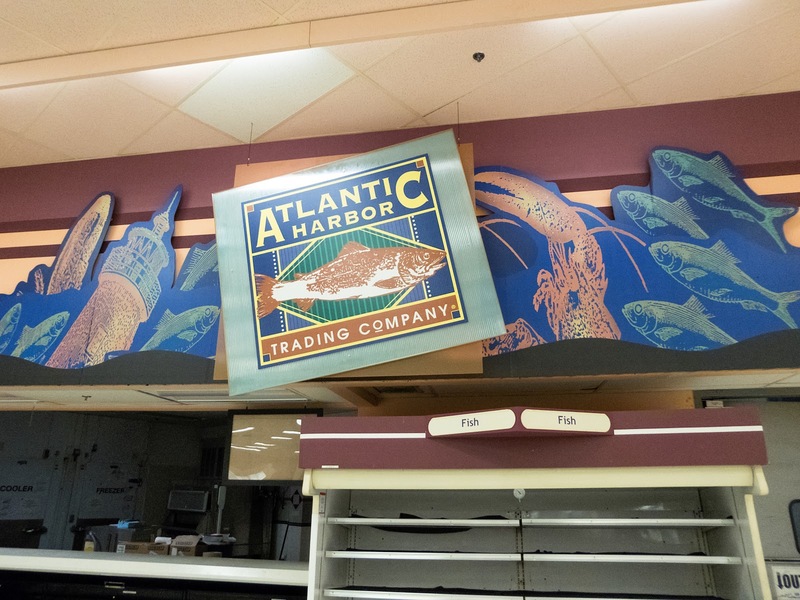 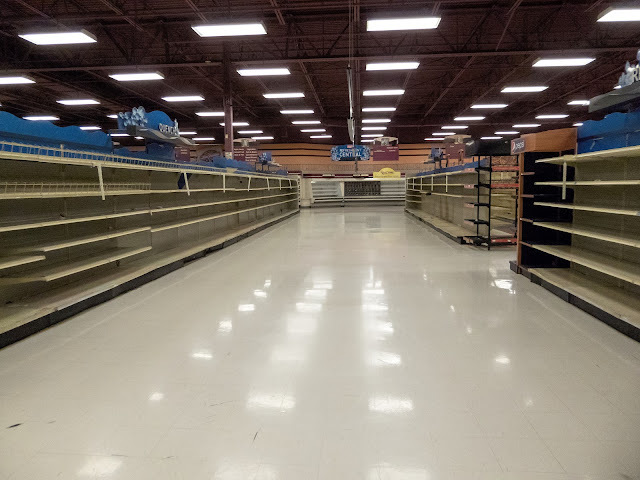 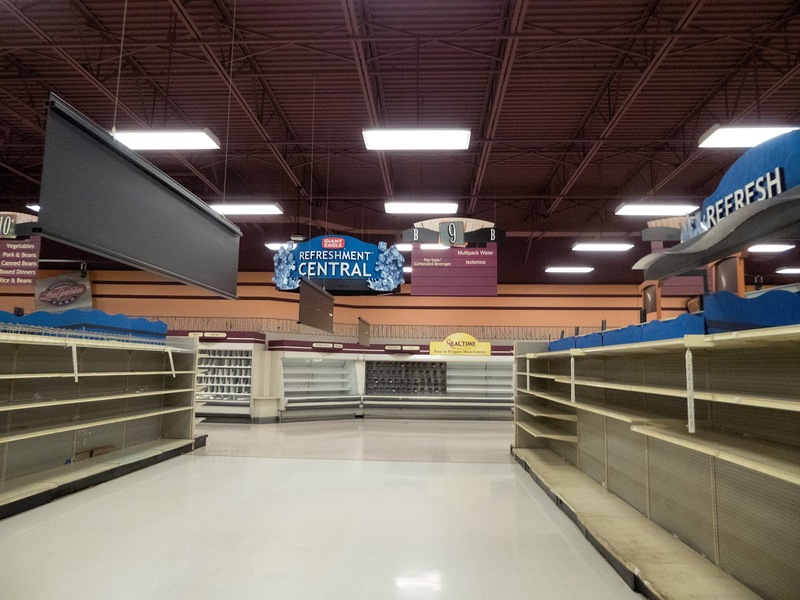 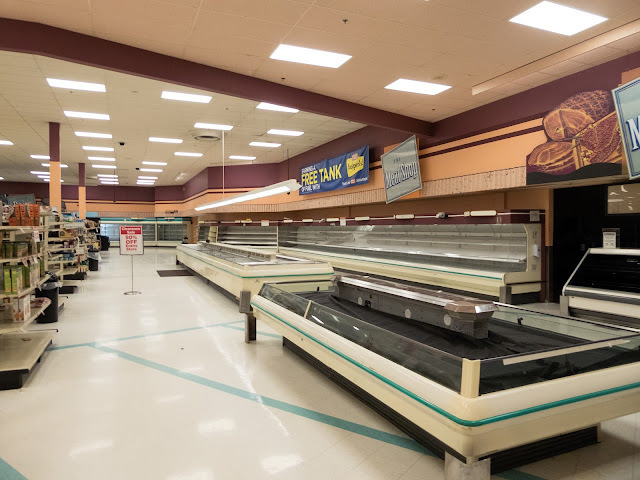 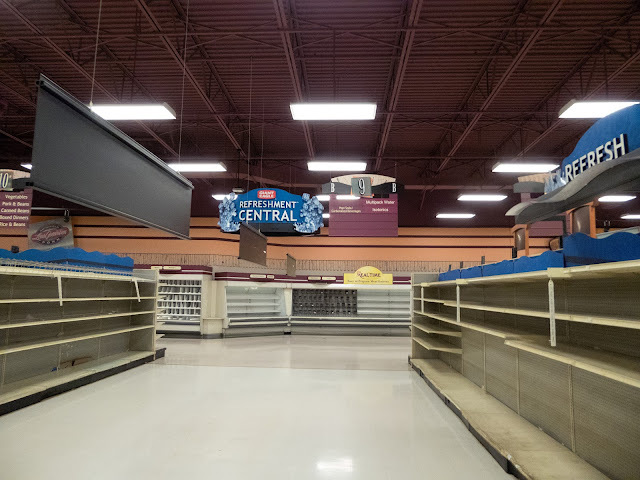 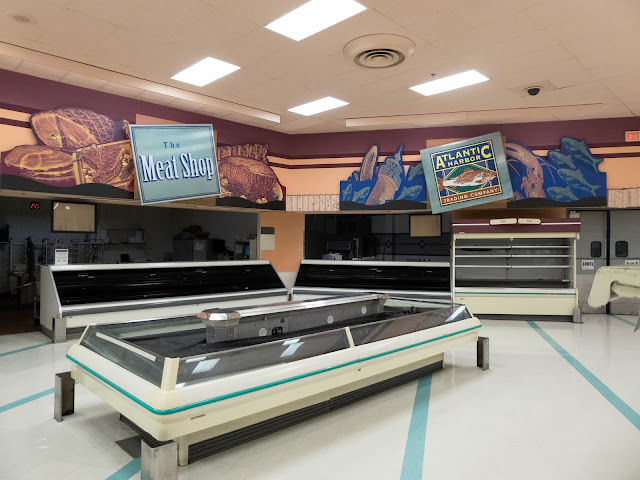 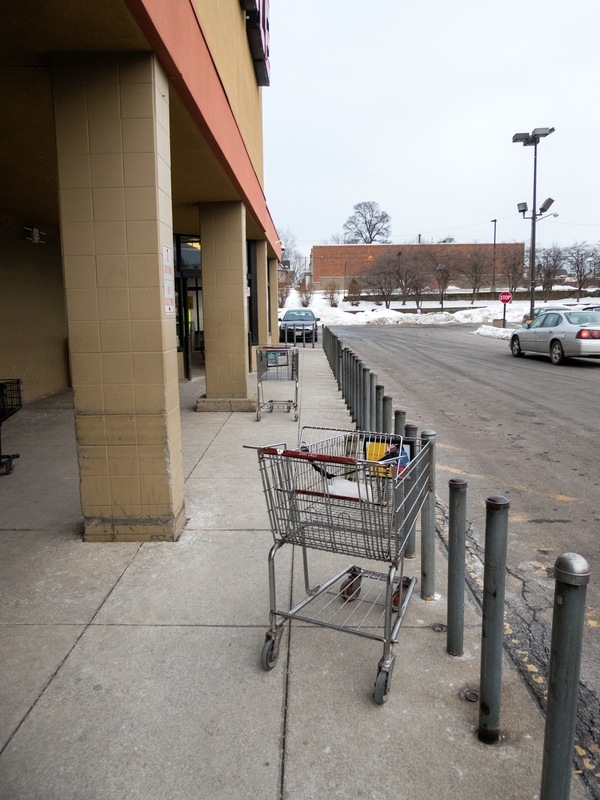 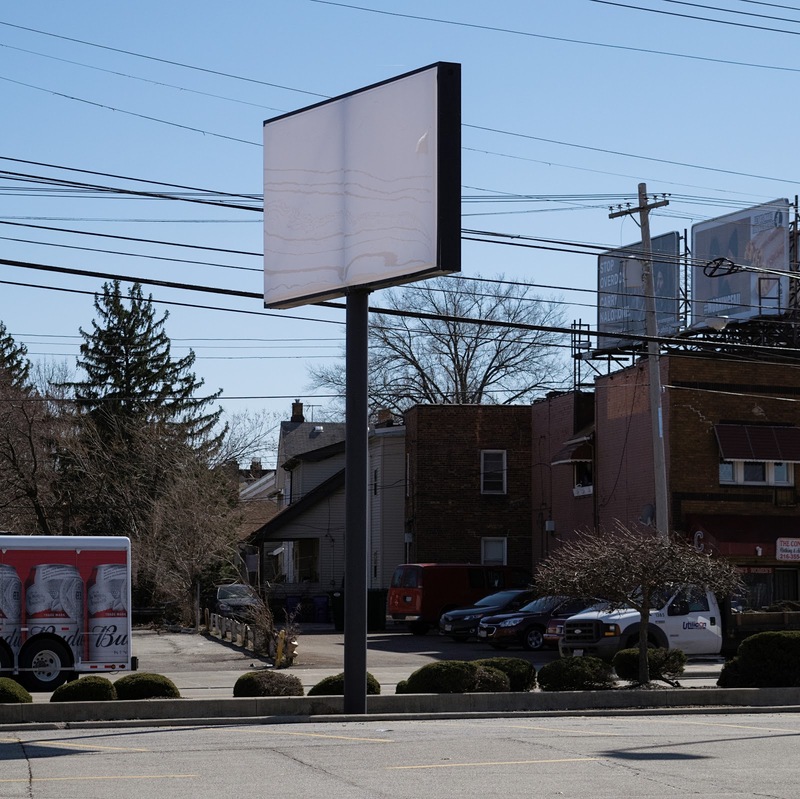 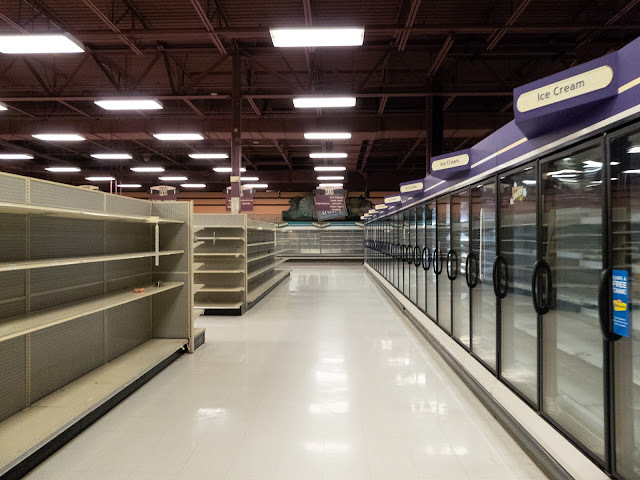 That said, Acme, Buehler's, and Fishers Foods are more traditional grocery stores, but they don't have a presence around Cleveland, just to the south in areas like Akron and Canton. 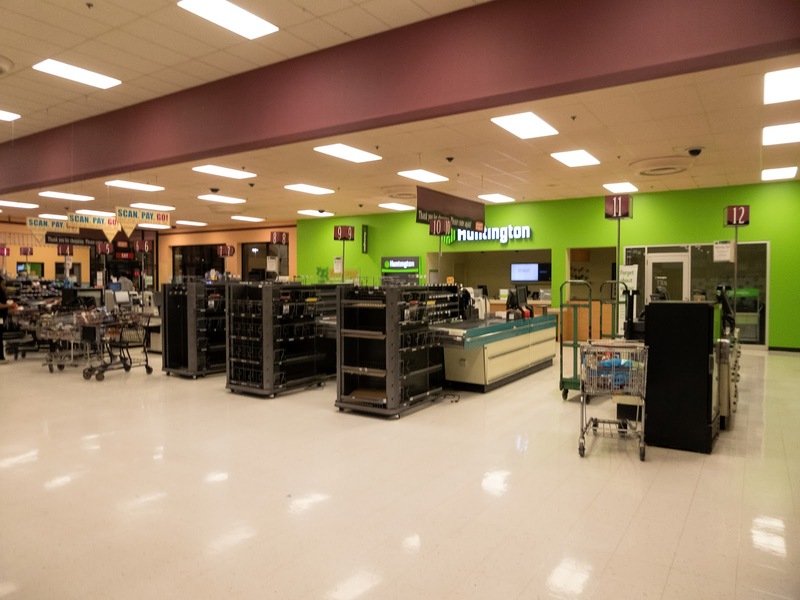 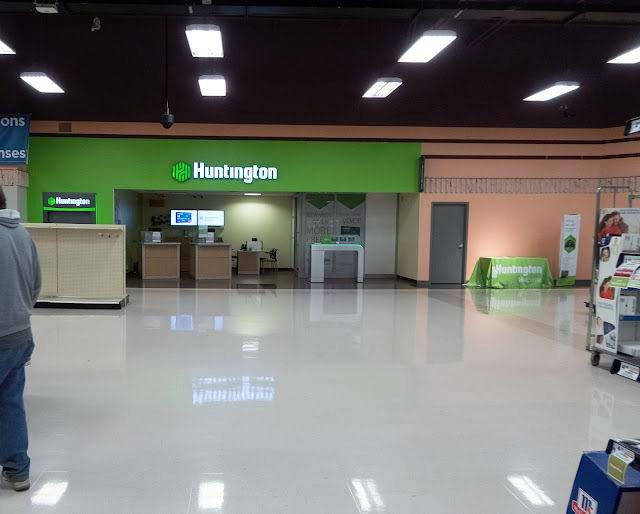 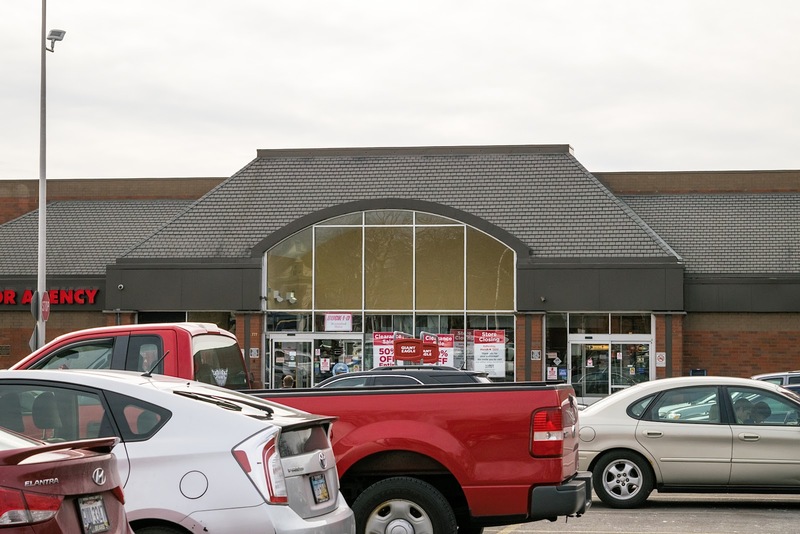 Heinen's is more of an upper-scale store and Marc's is a discount store; while they do have stores throughout NE Ohio, they are not too large of direct competitors. Dave's is a more traditional grocery store, but they mostly have a presence deep into Cleveland, not in the suburbs. 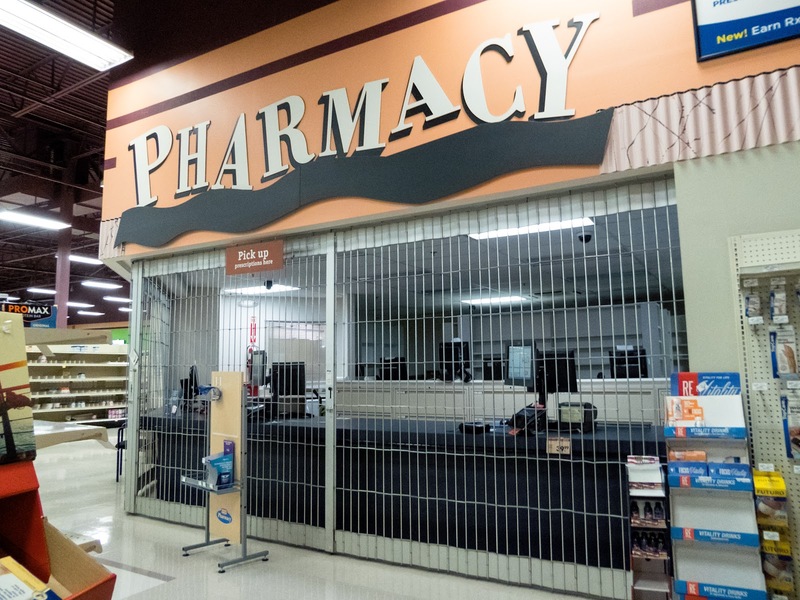 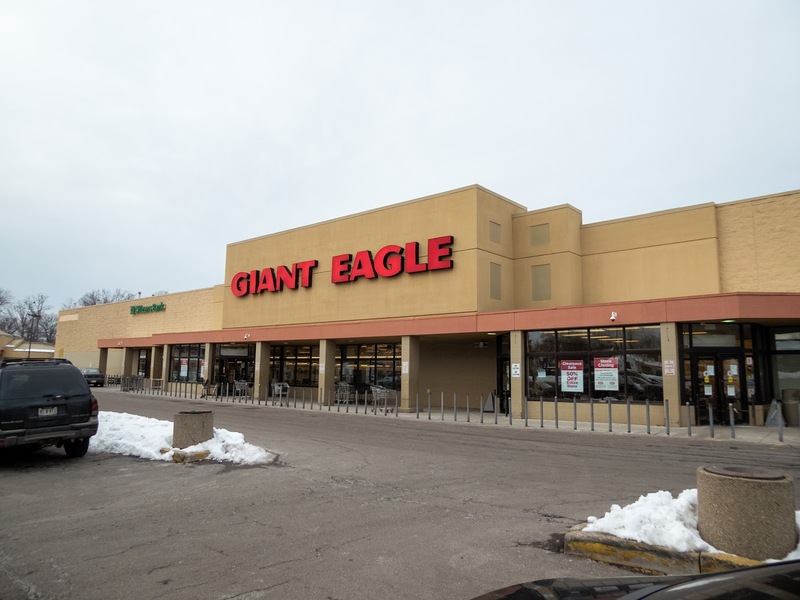 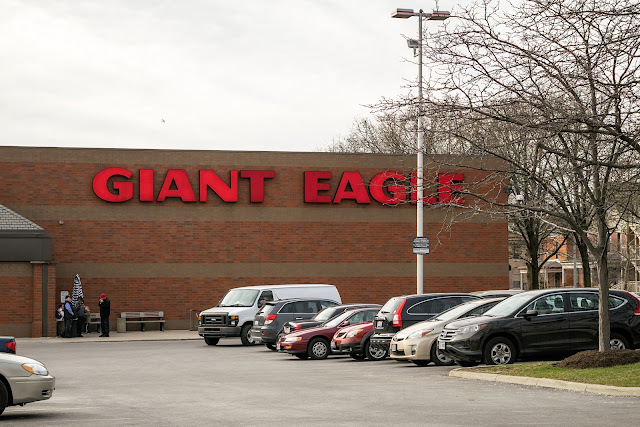 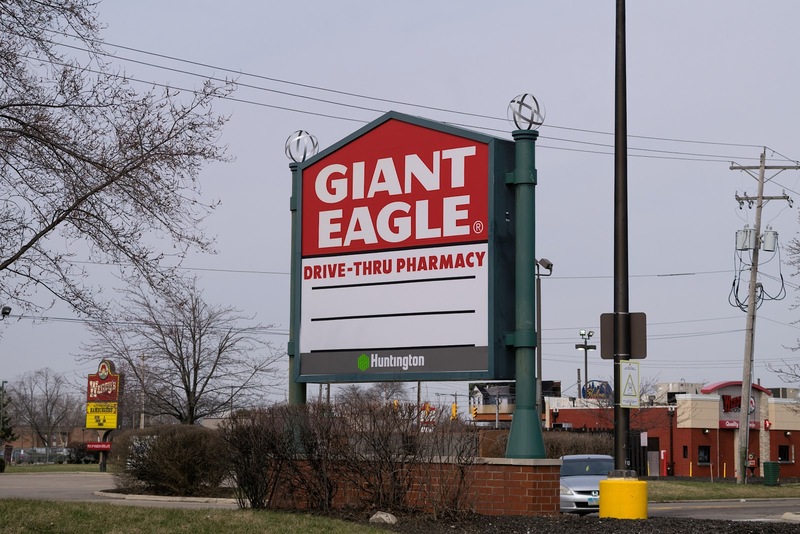 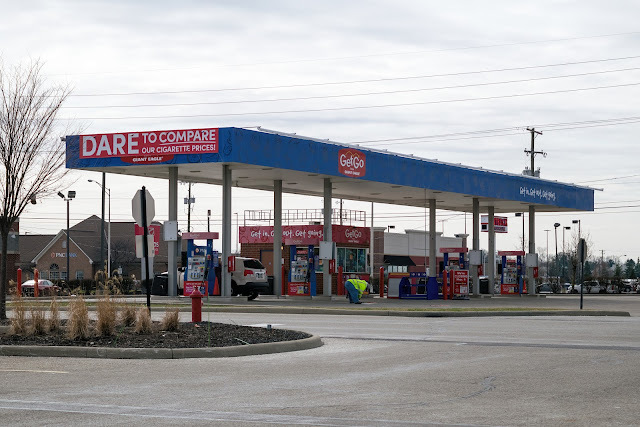 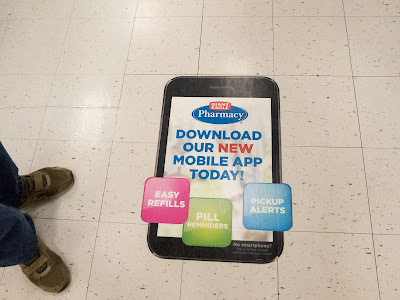 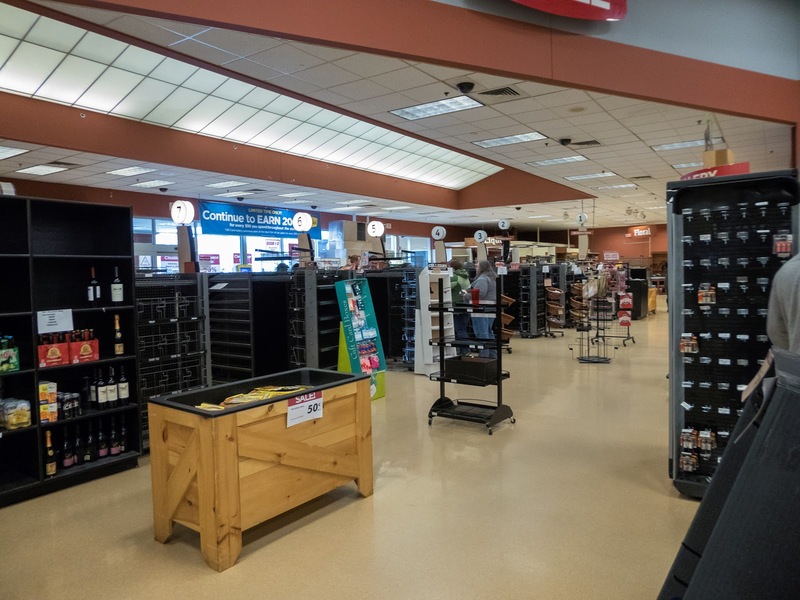 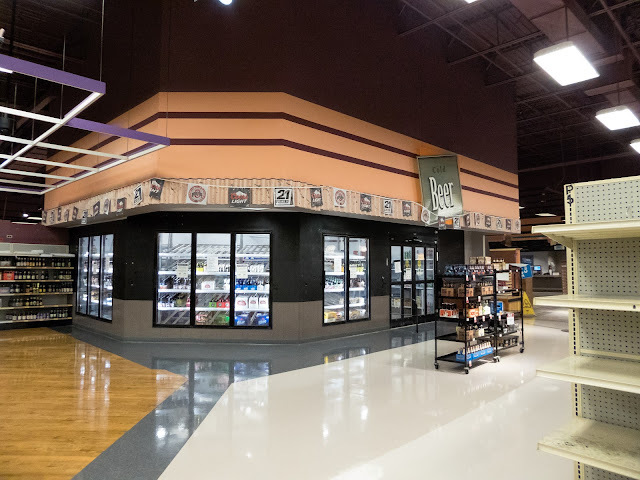 Also, Dave's has a strong relationship to Giant Eagle; Dave's is supplied by Giant Eagle (but locally ran)and some locations have Giant Eagle pharmacies in them. 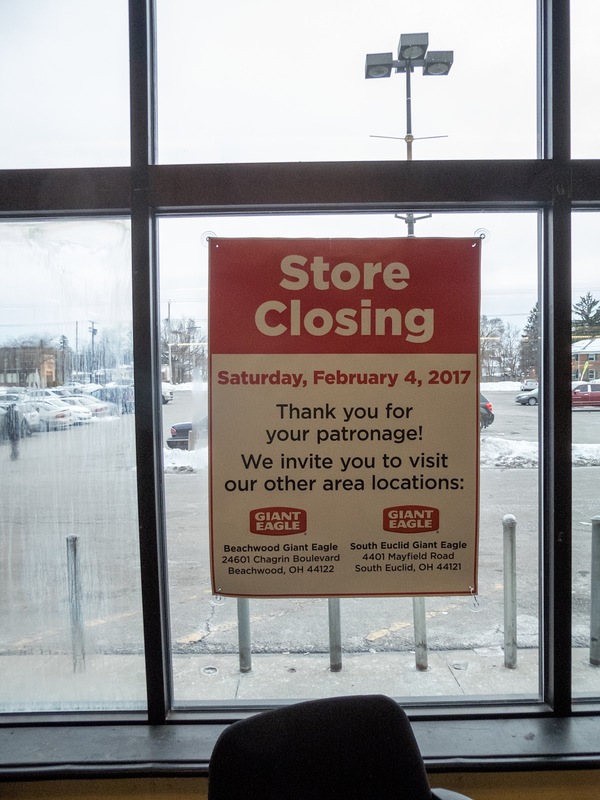 Some locations have gone from Giant Eagle to Dave's or Dave's to Giant Eagle, so they have swapped some stores before. 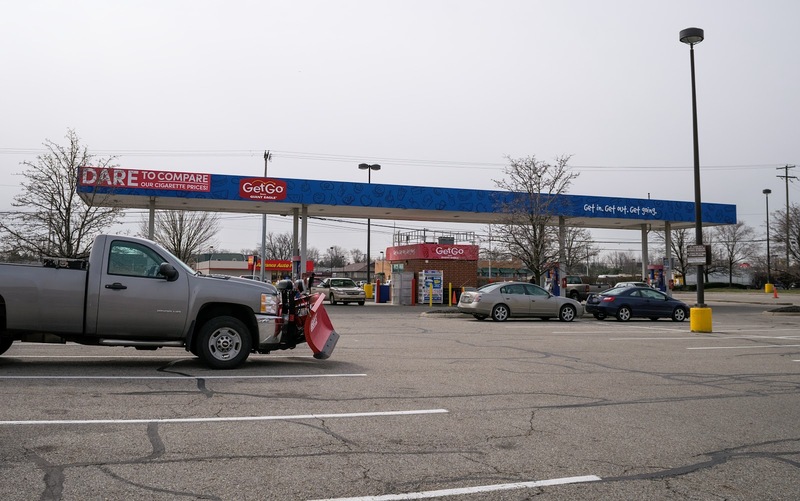 That Lorain Avenue store is typical for a 1990s Rini-Rego / Stop-n-Shop store. 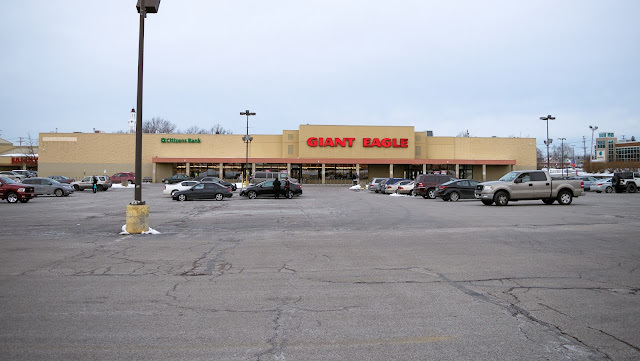 I was basing the mid 1990s build date off of historical aerial imagery from 1994 that didn't show the store built yet. 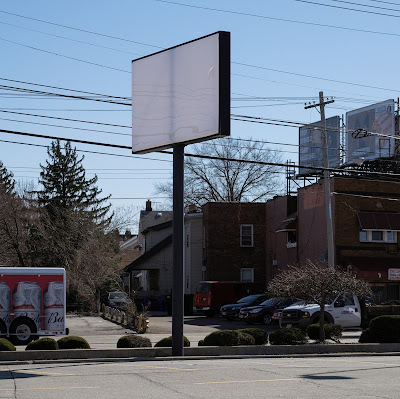 You can usually get dates from the assessor's website, but the one for Cuyahoga County doesn't include build dates for buildings. 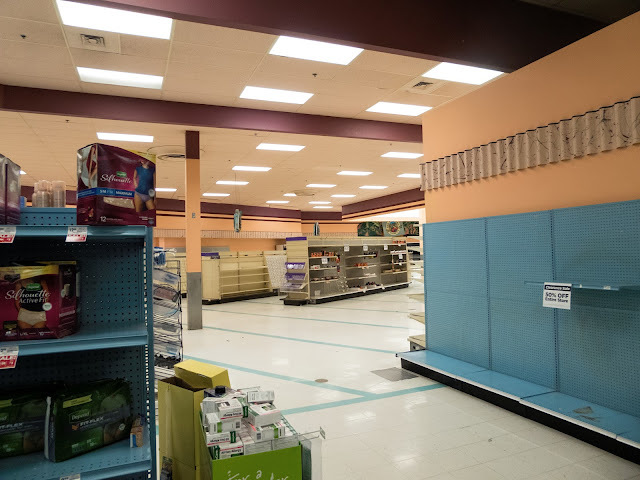 Rini-Rego did use more of a retro design with the drop ceiling and lights over certain areas. 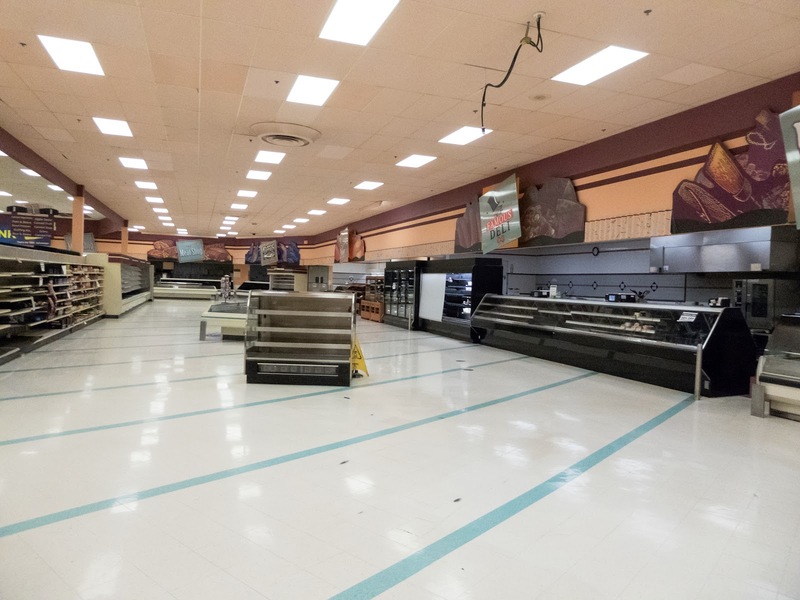 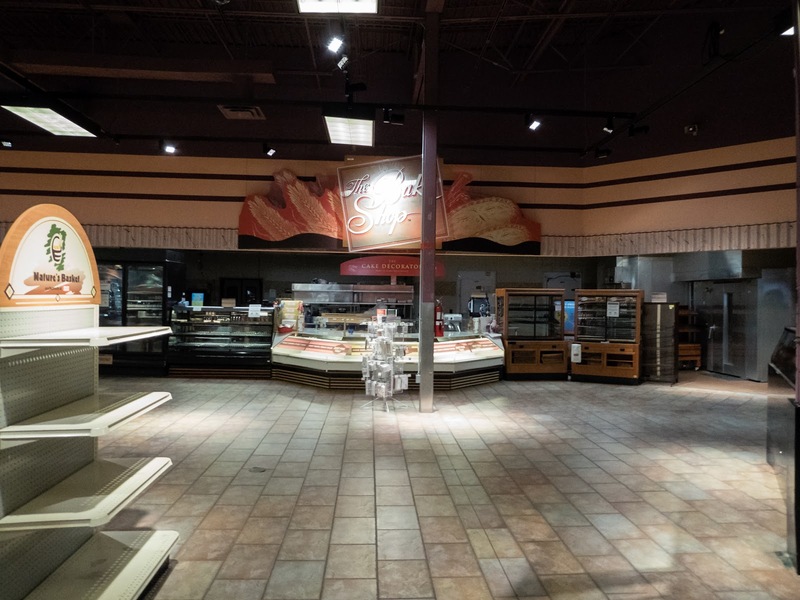 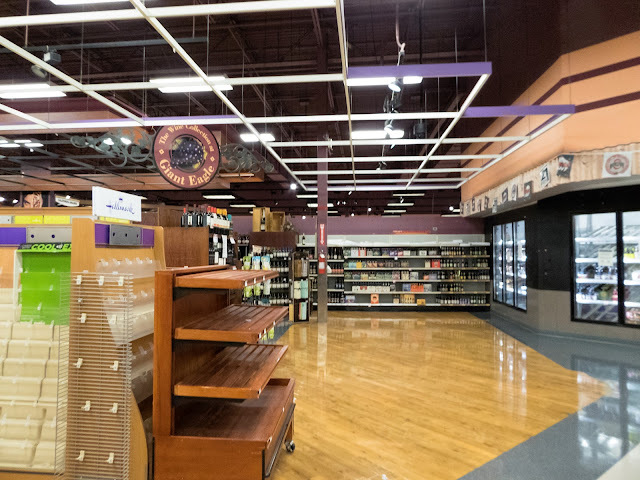 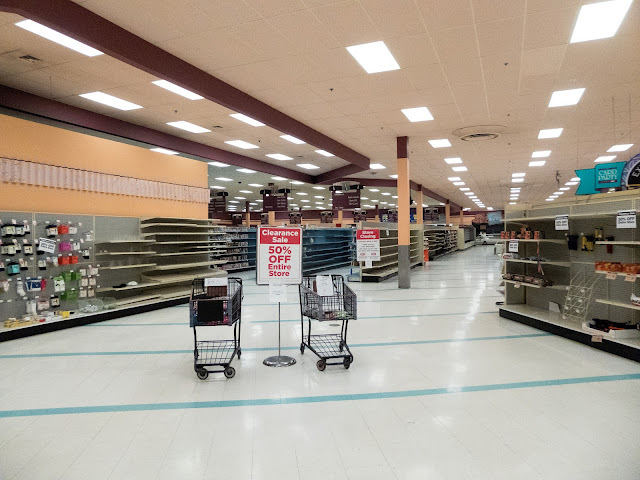 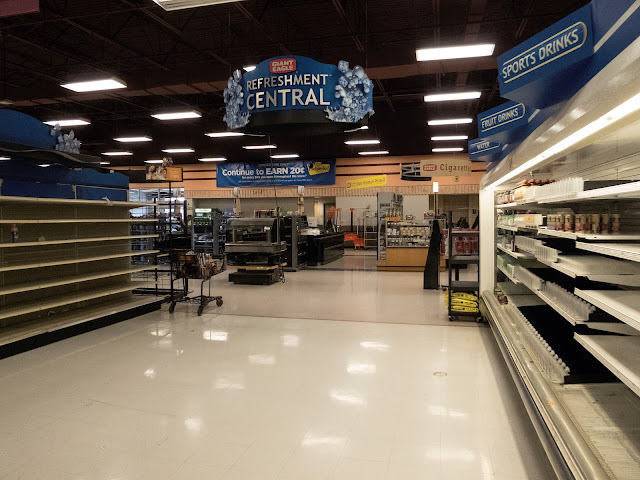 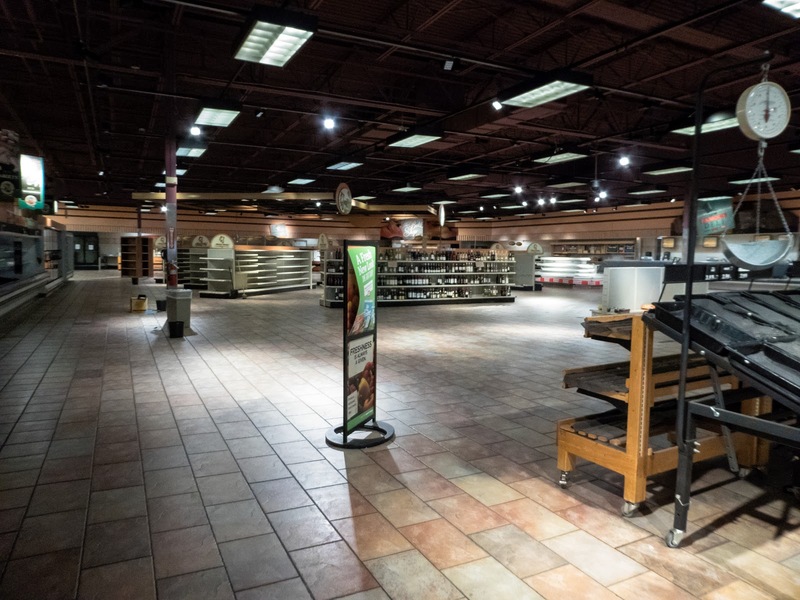 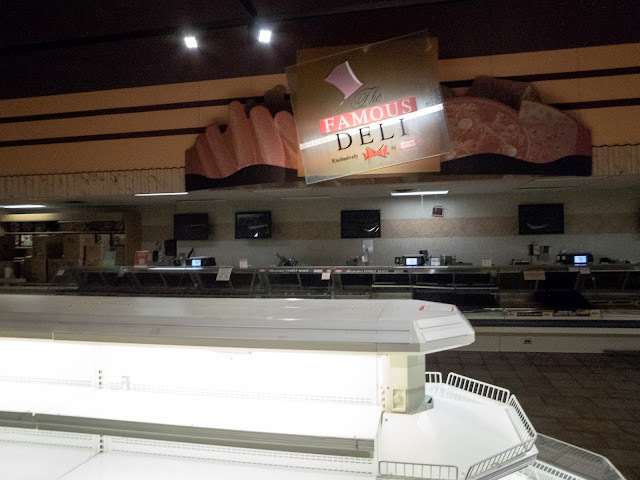 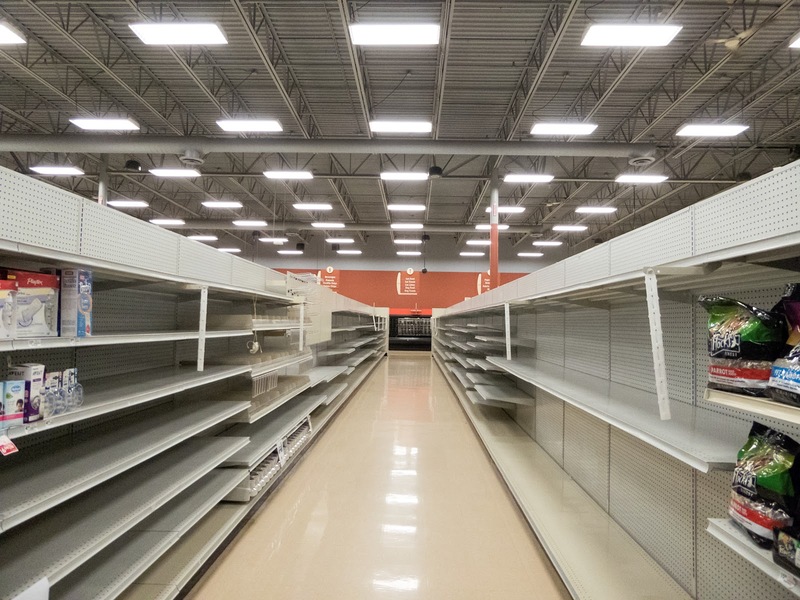 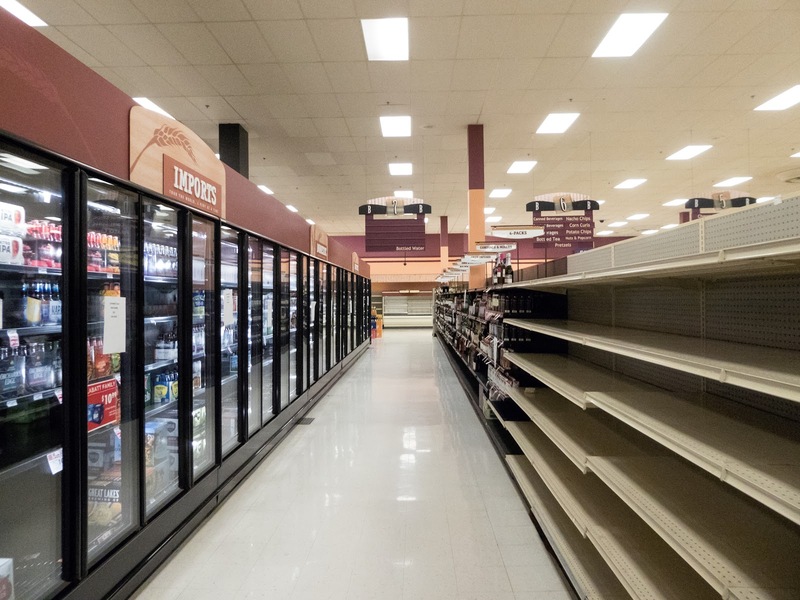 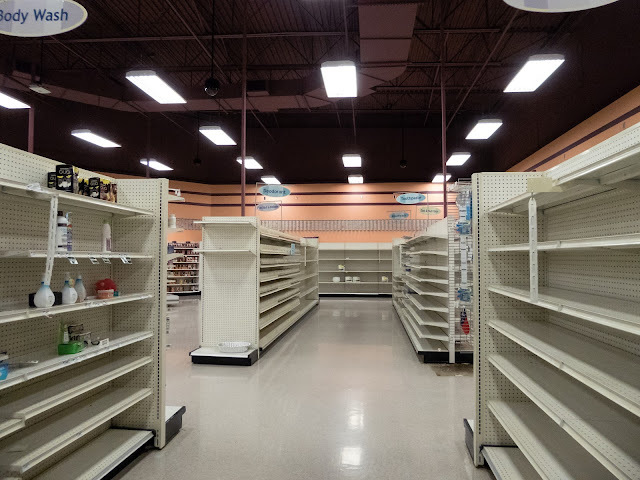 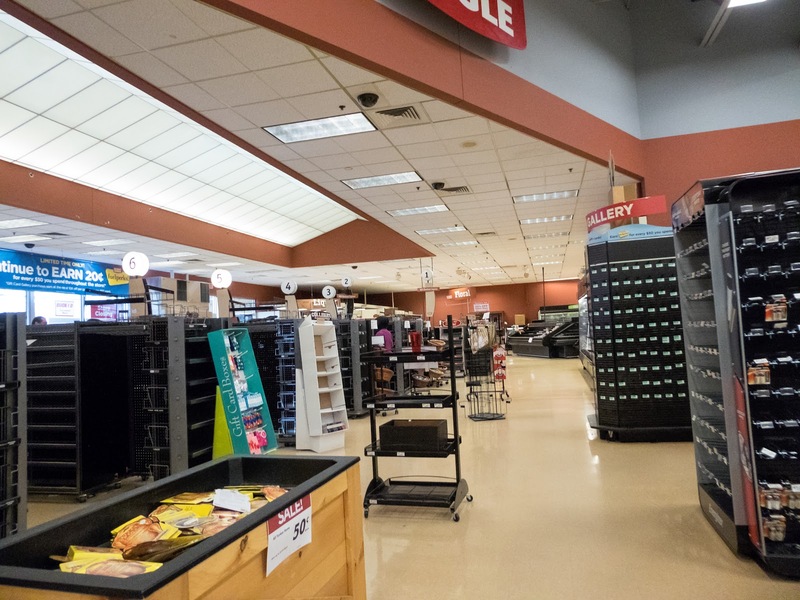 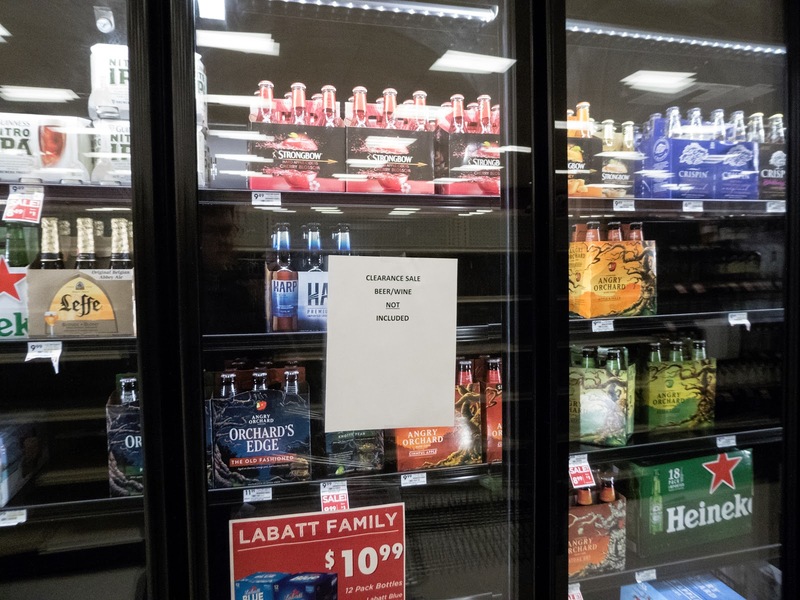 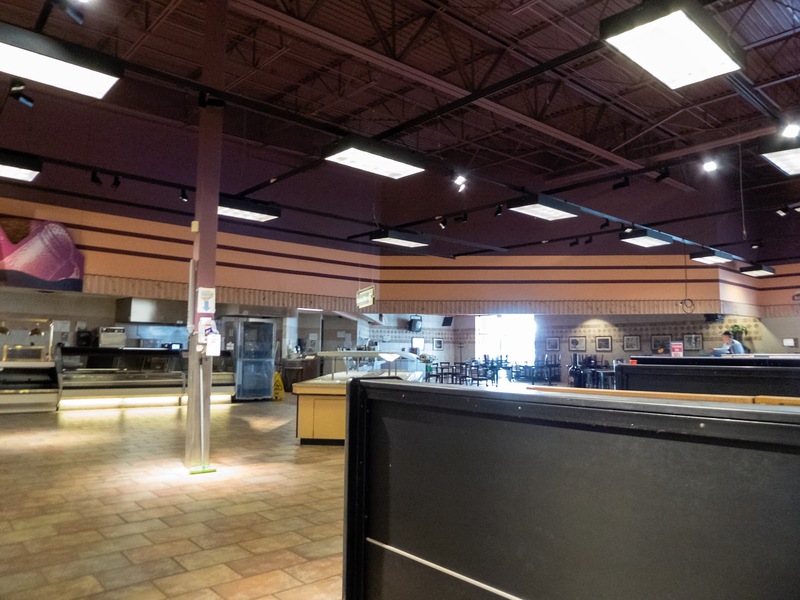 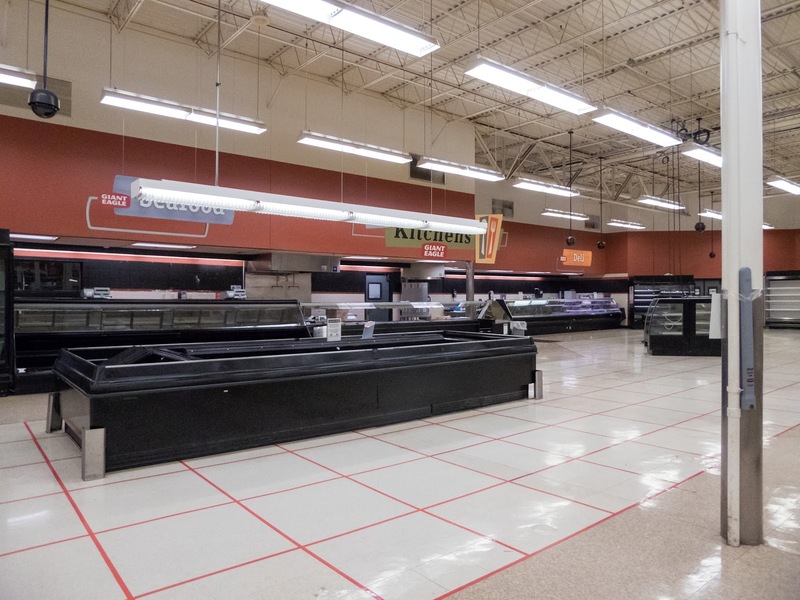 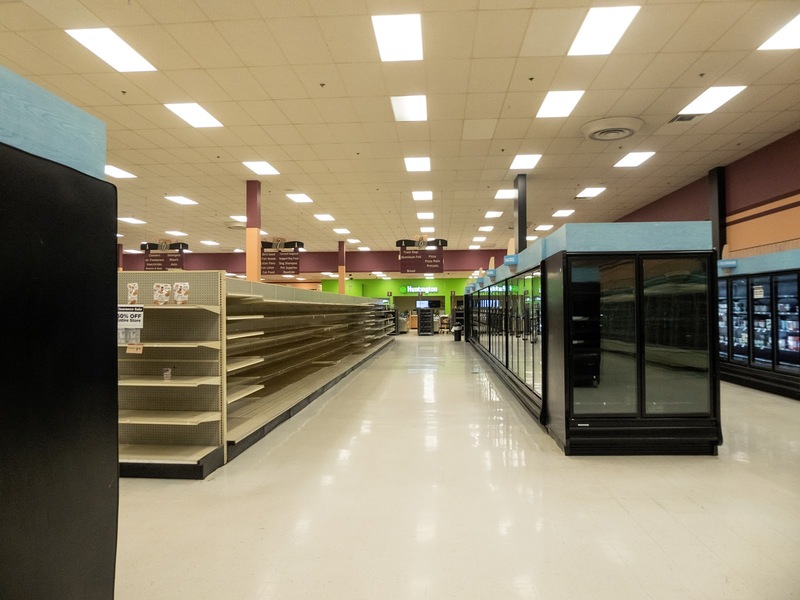 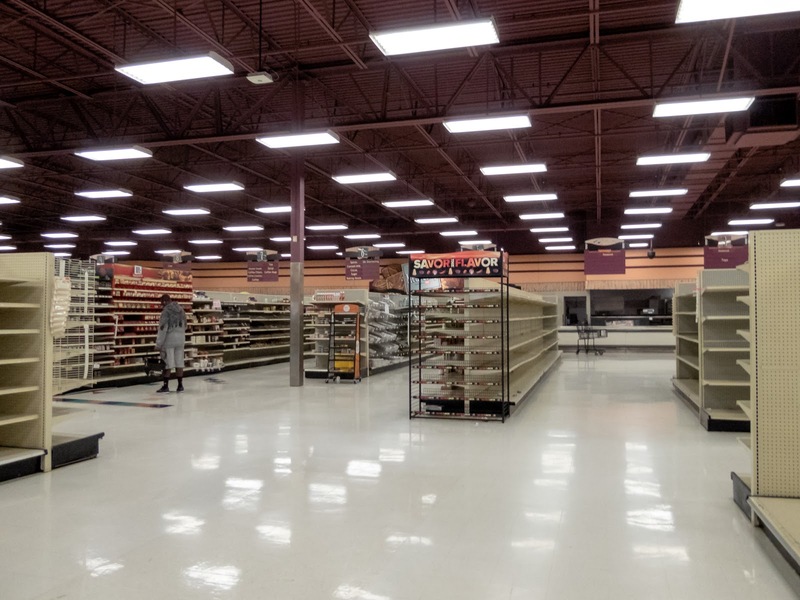 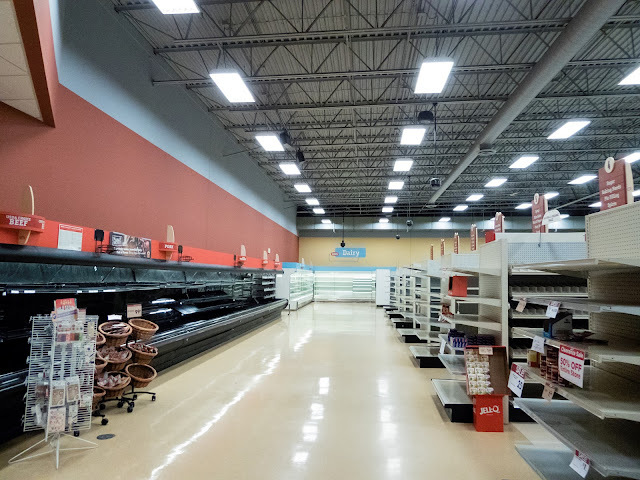 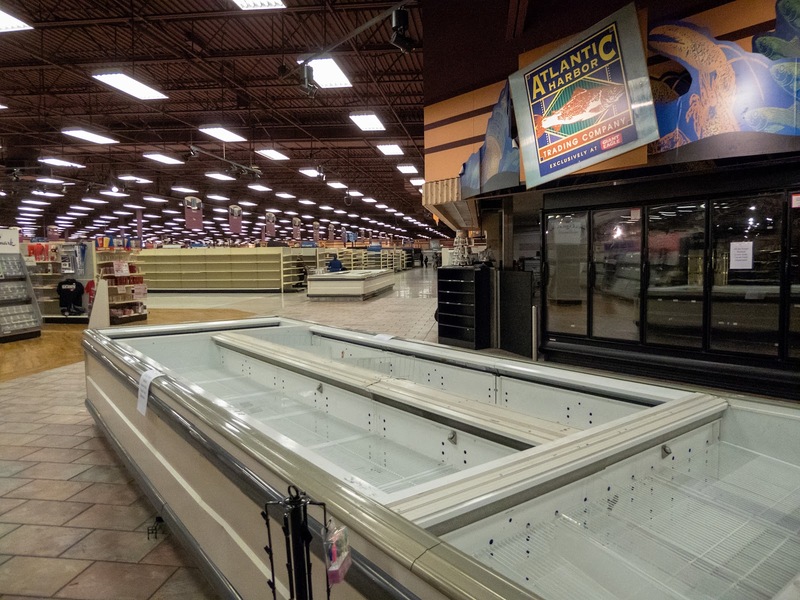 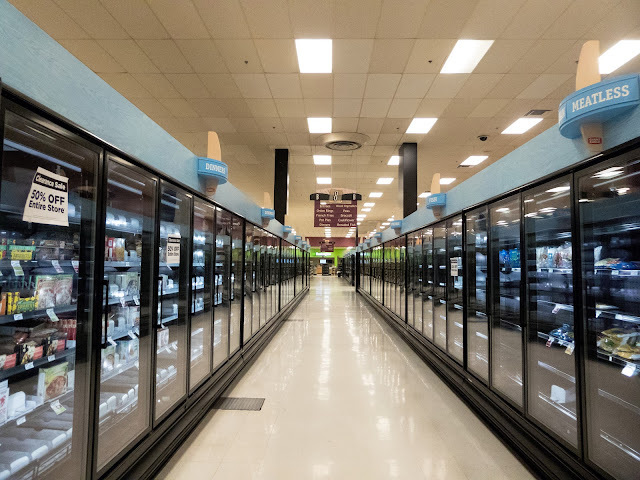 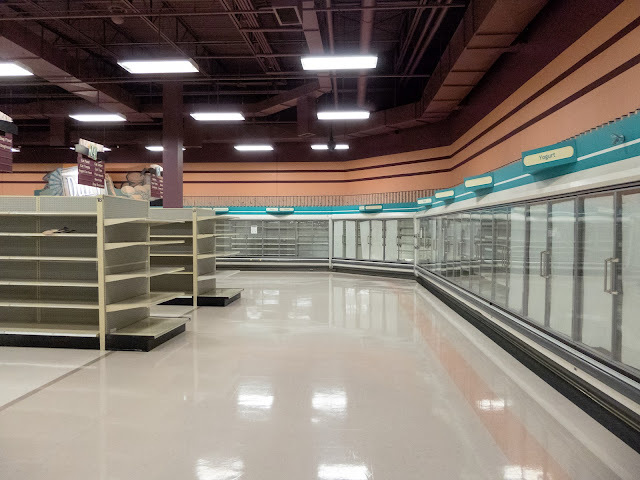 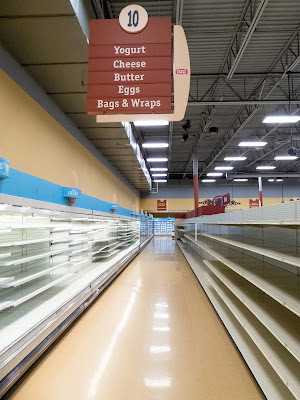 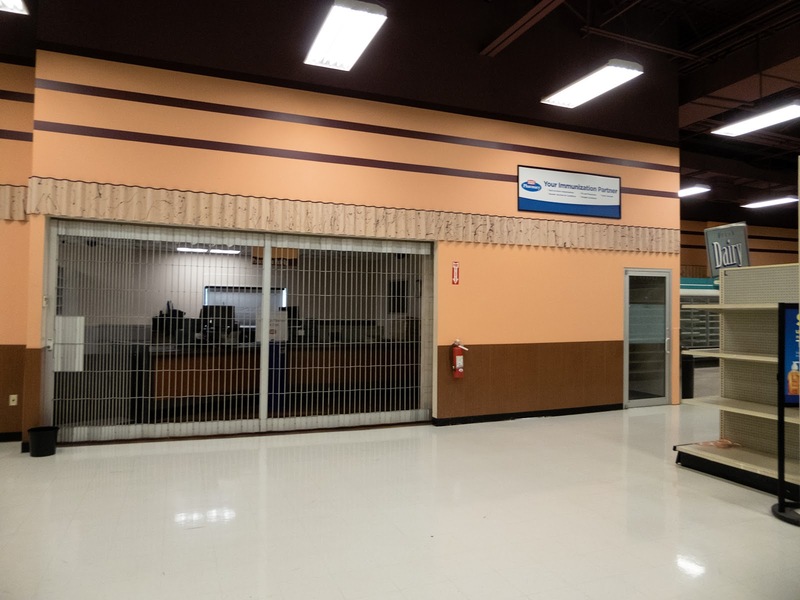 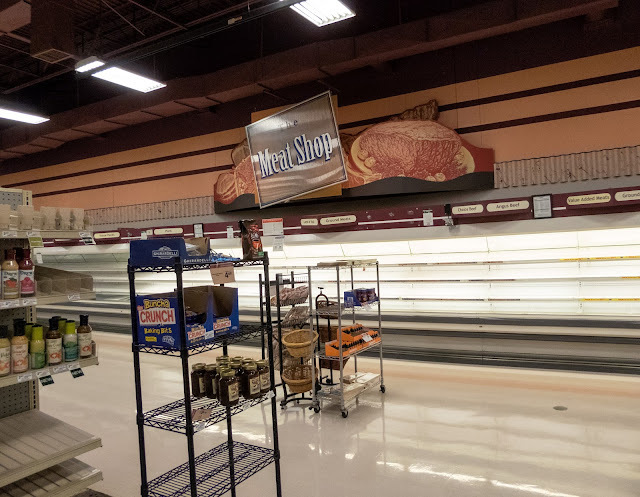 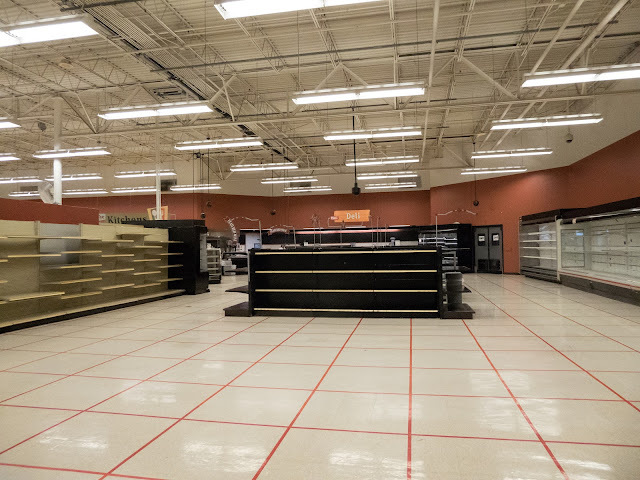 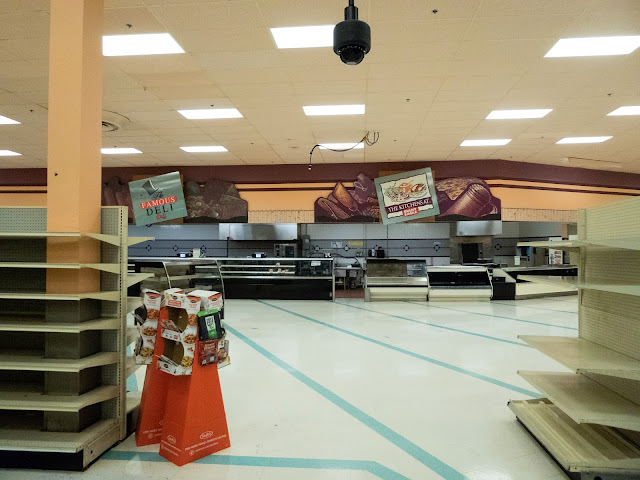 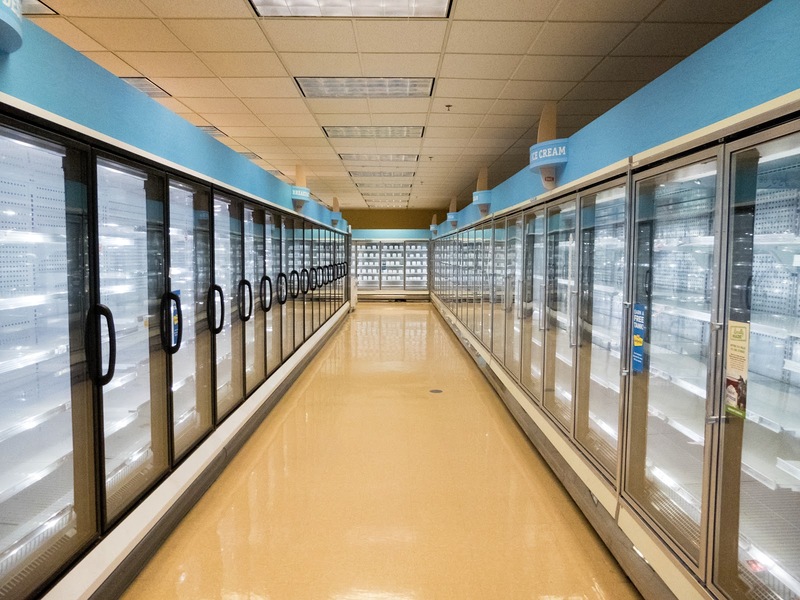 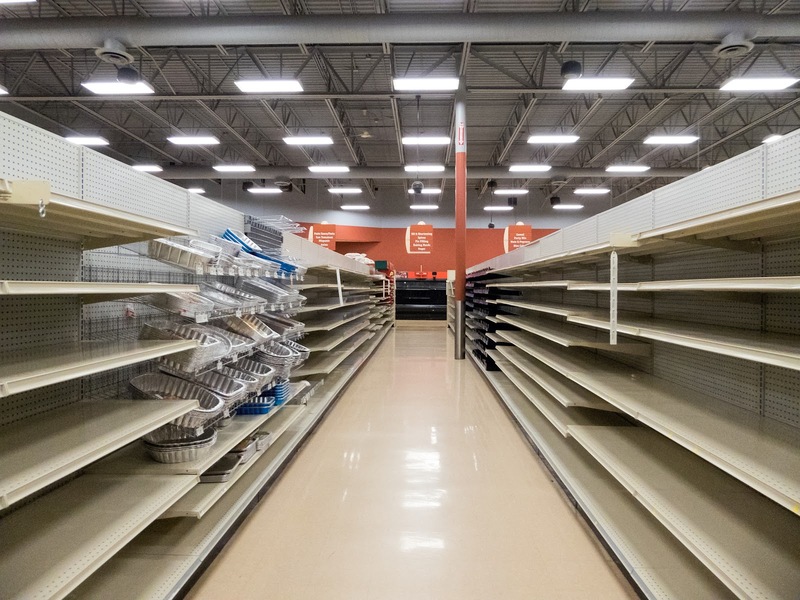 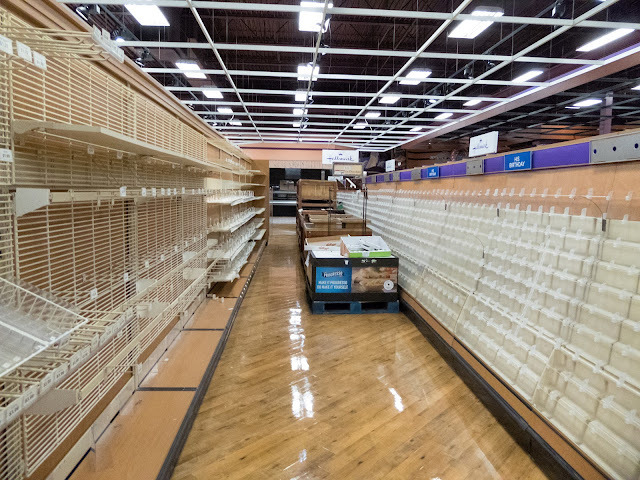 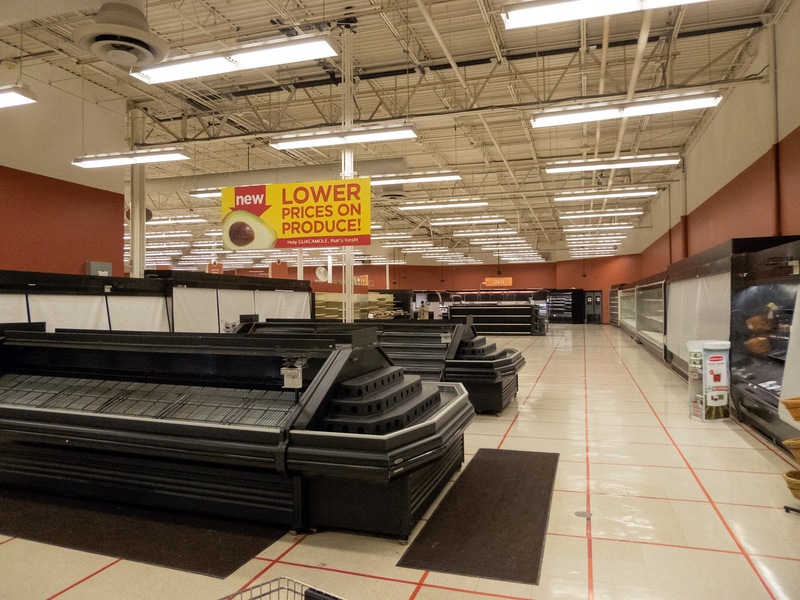 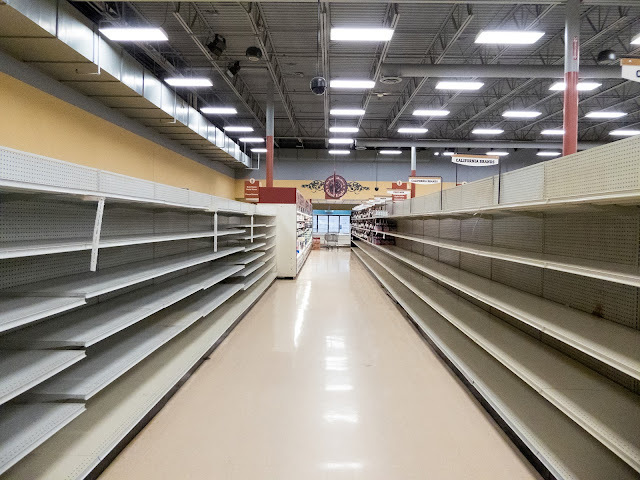 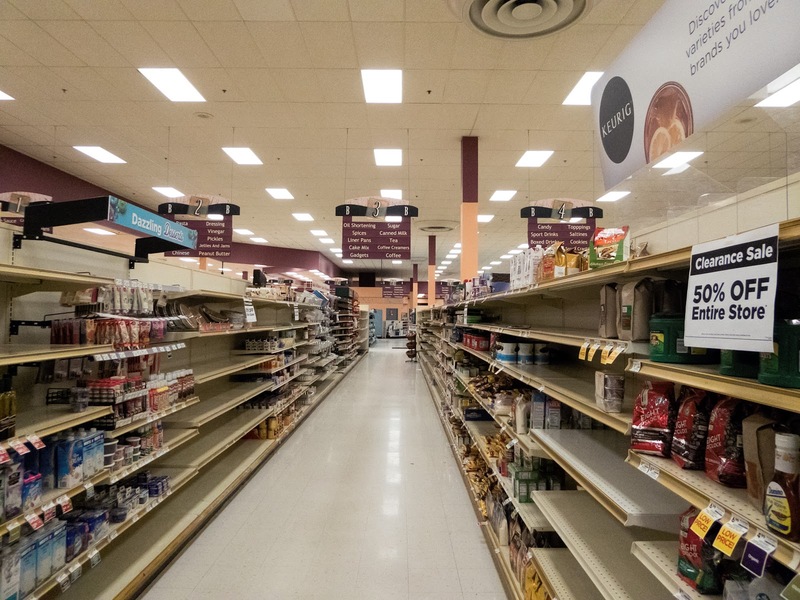 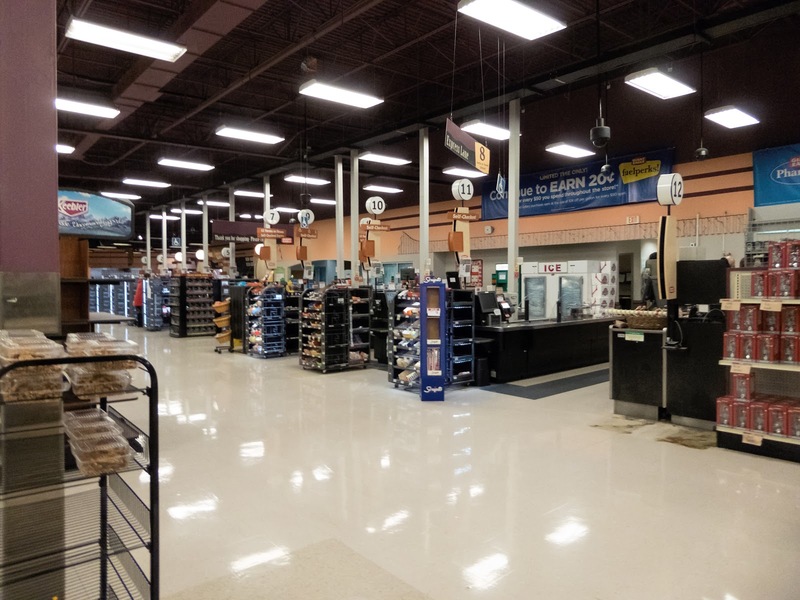 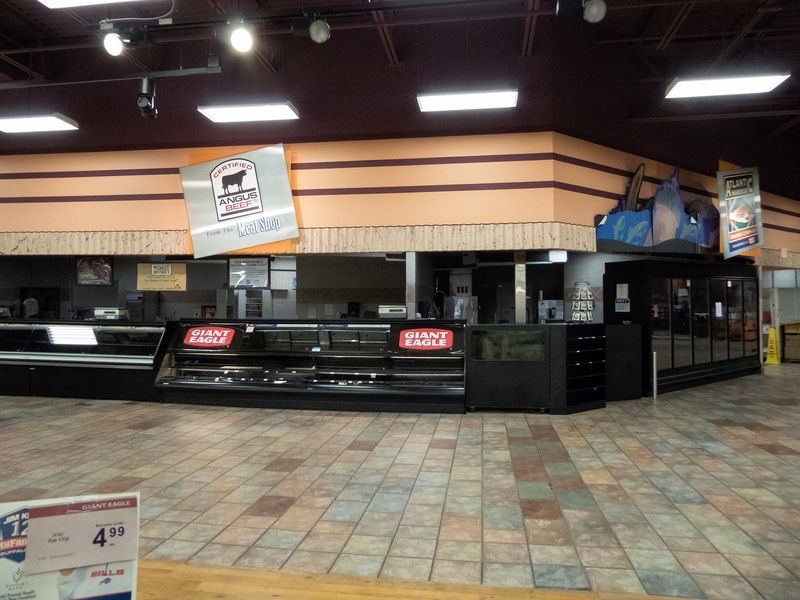 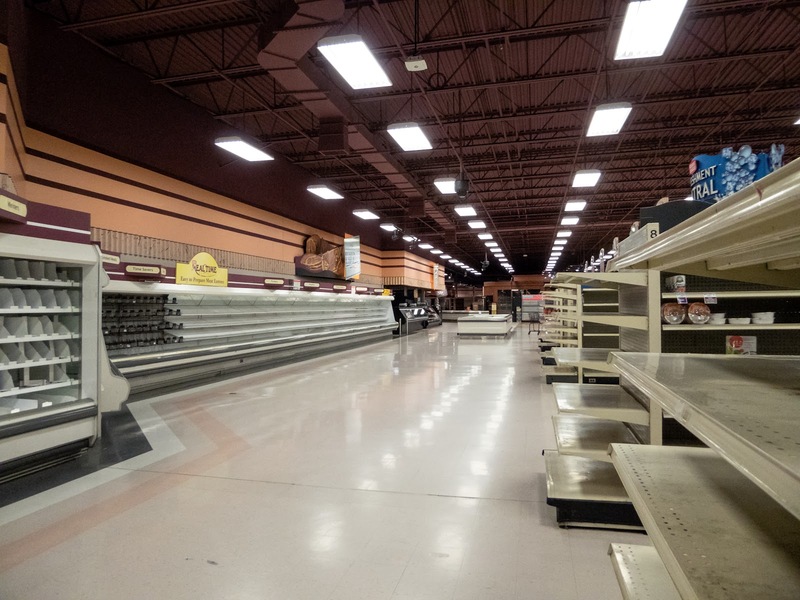 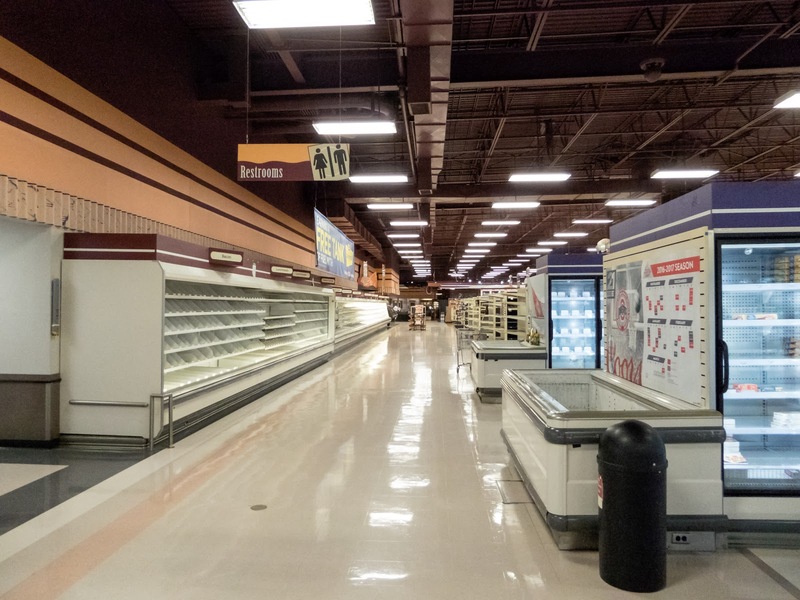 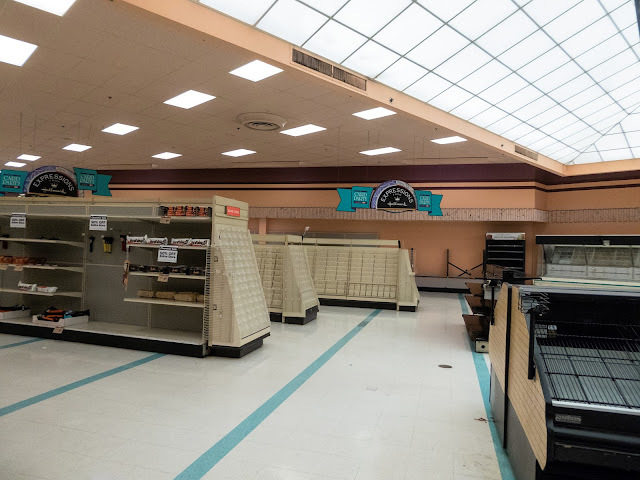 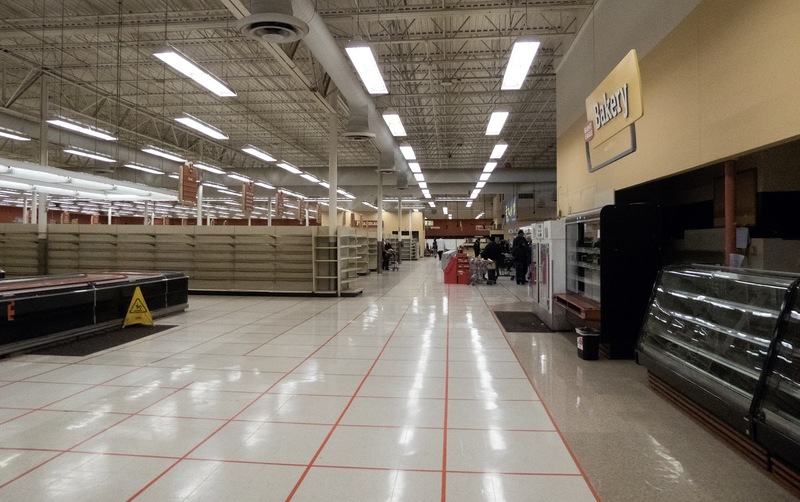 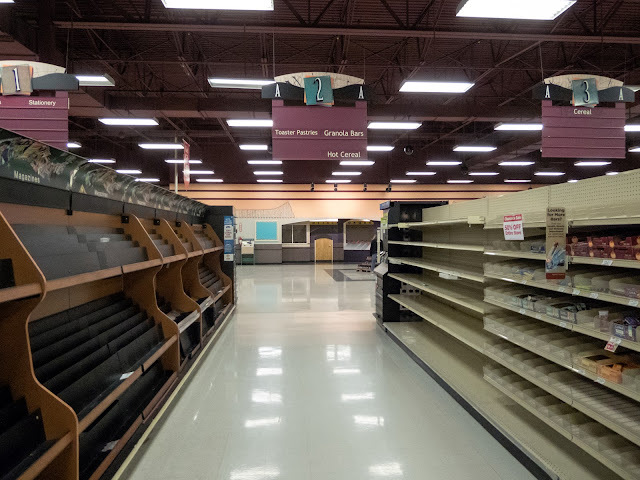 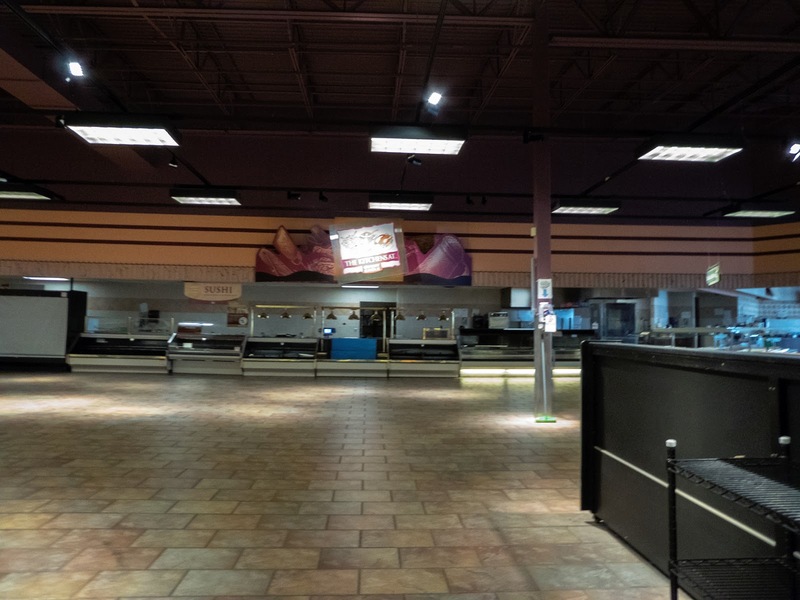 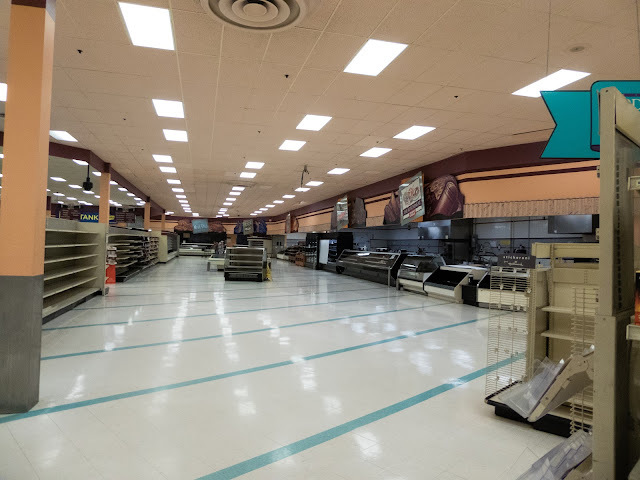 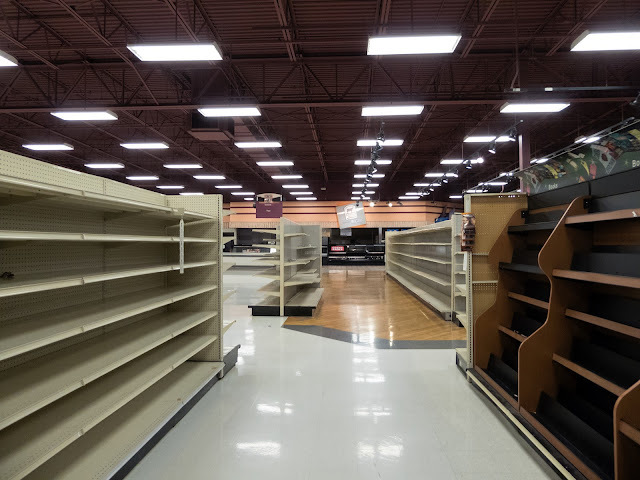 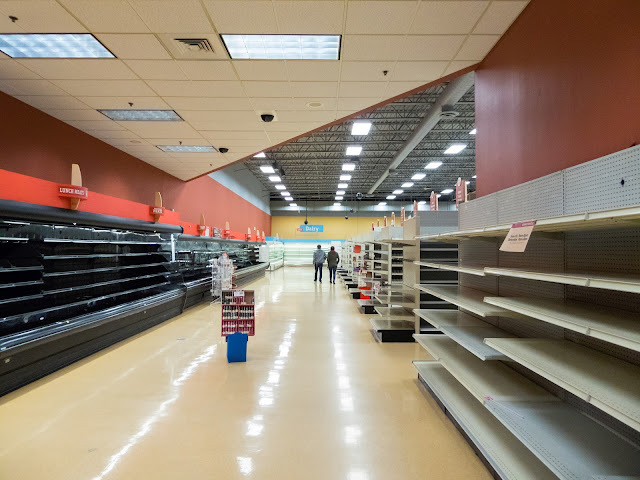 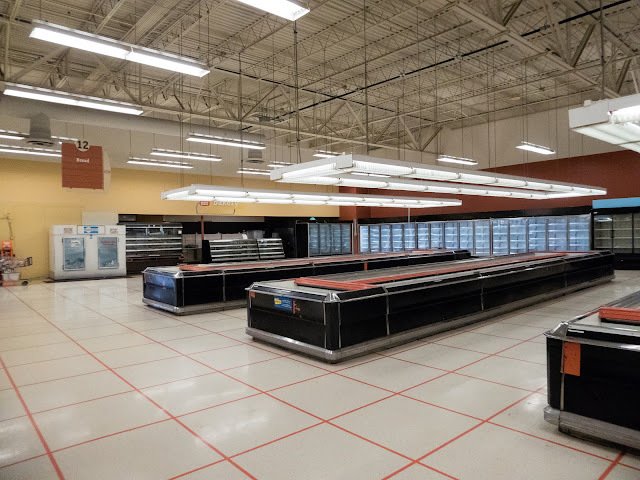 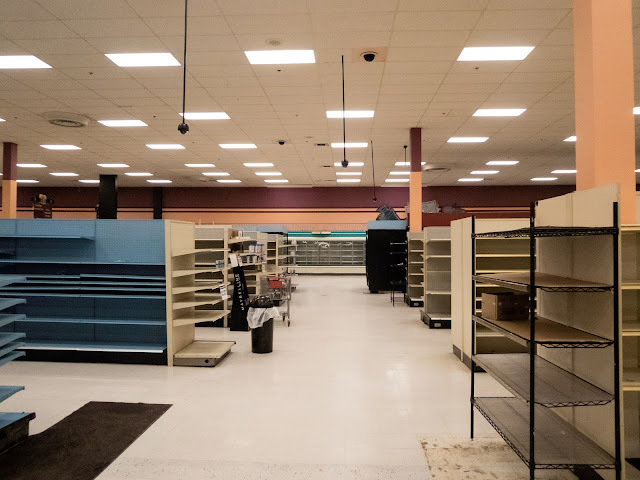 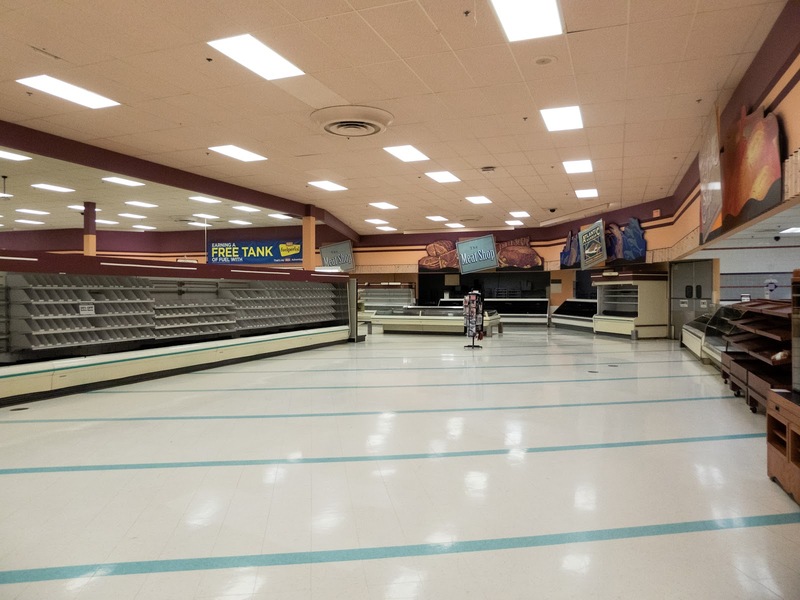 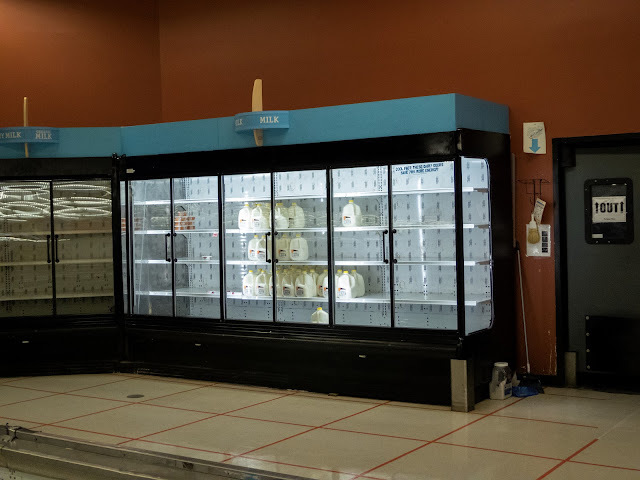 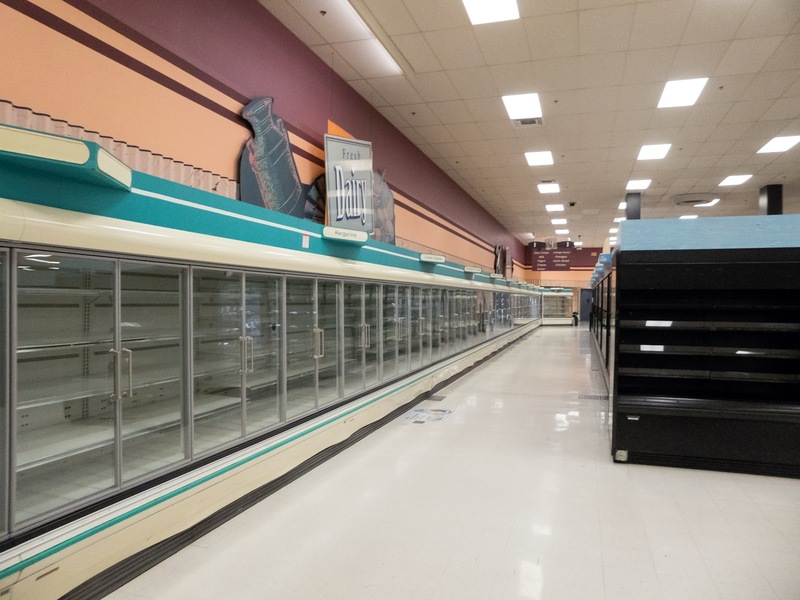 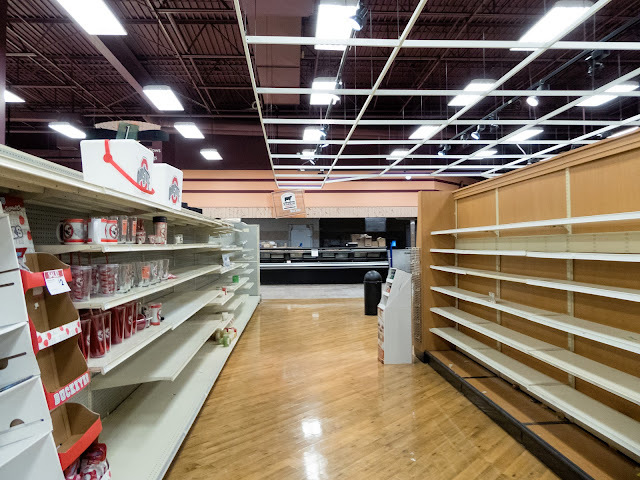 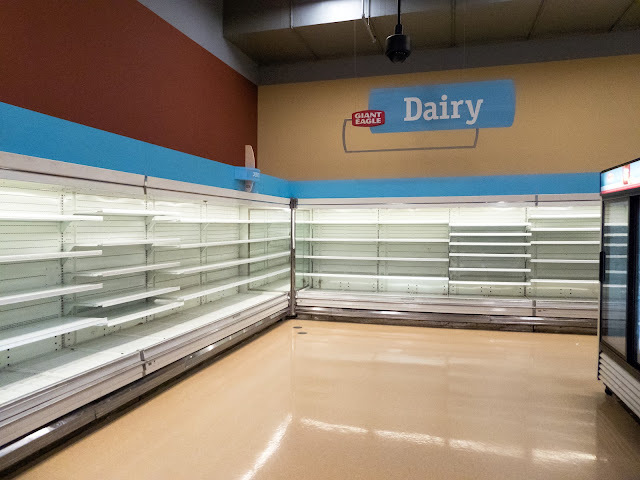 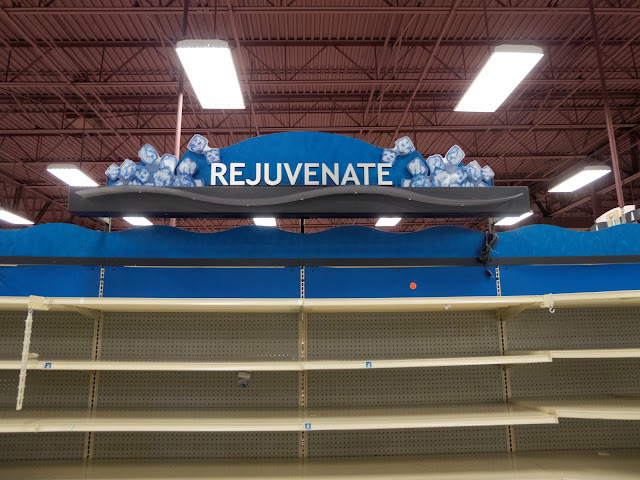 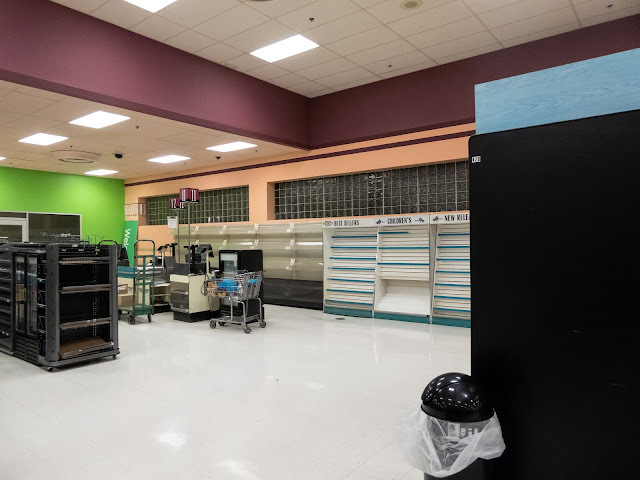 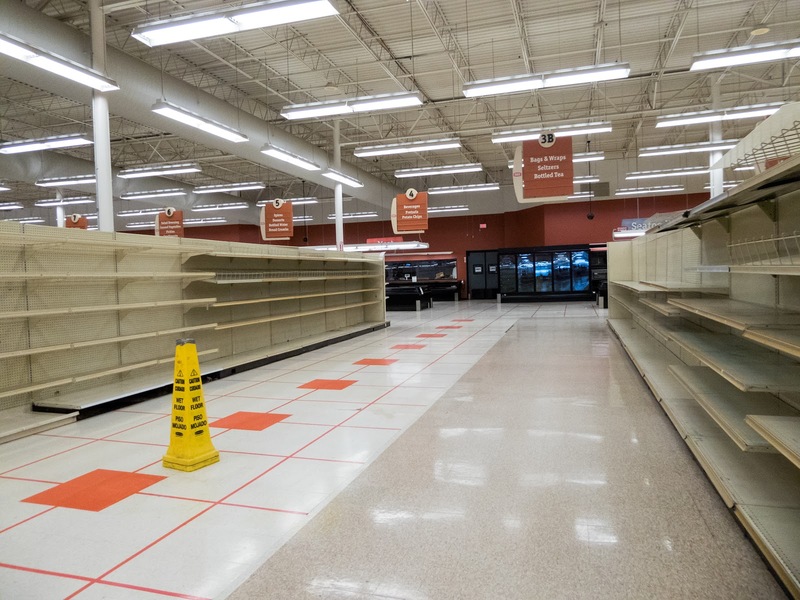 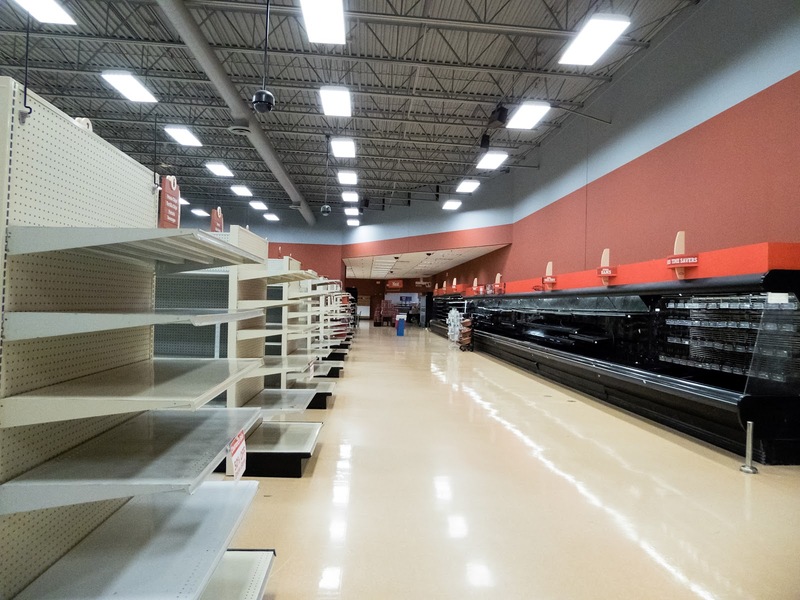 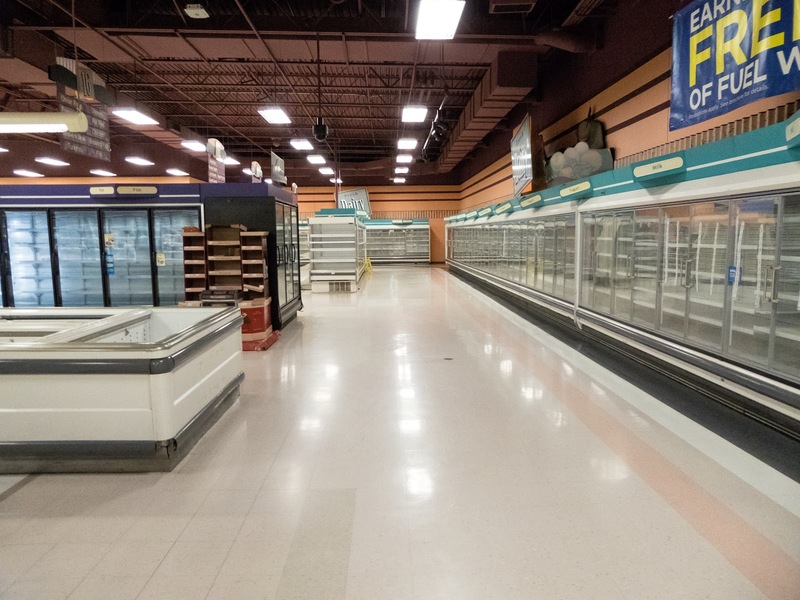 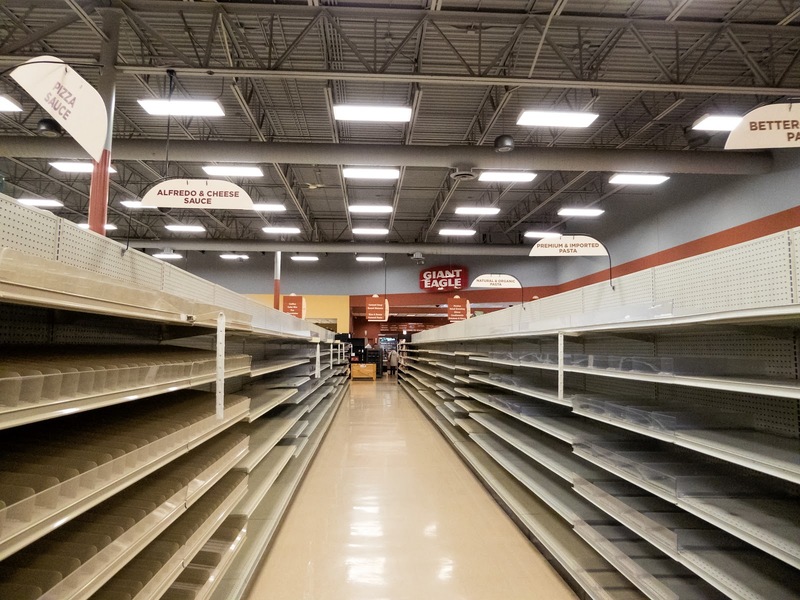 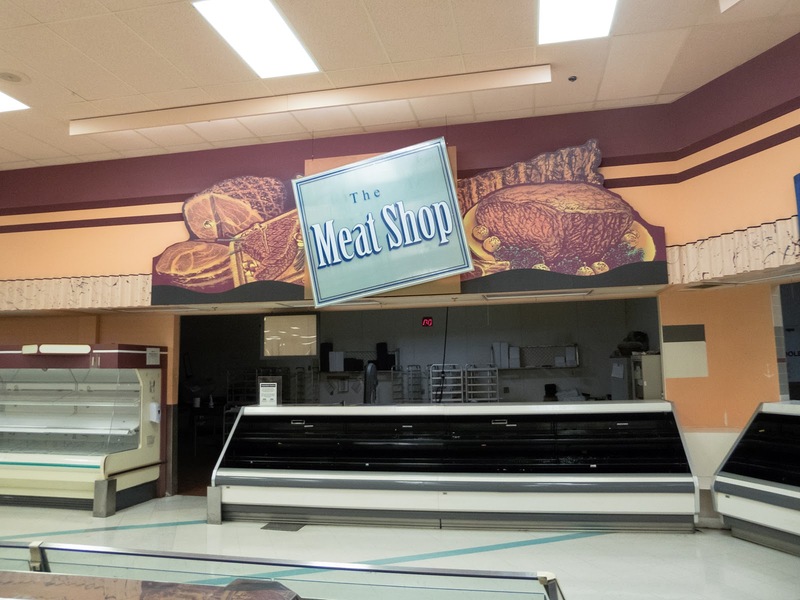 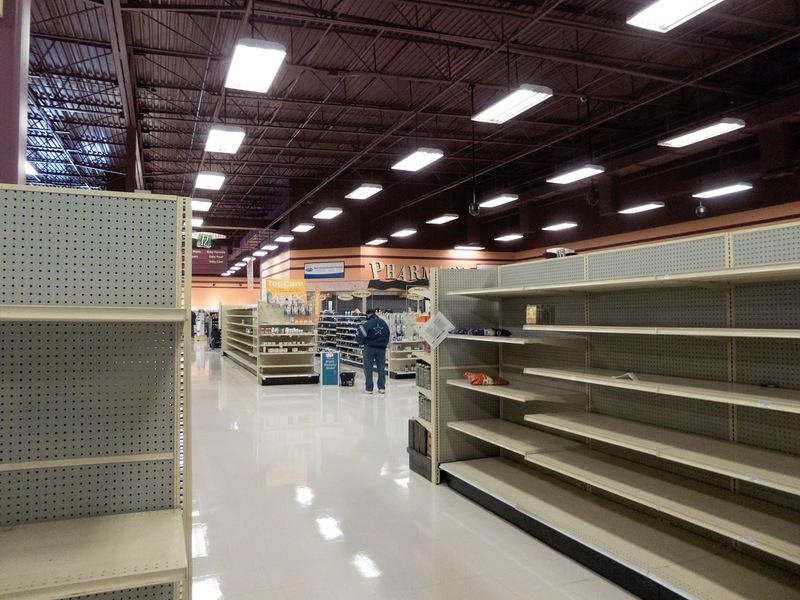 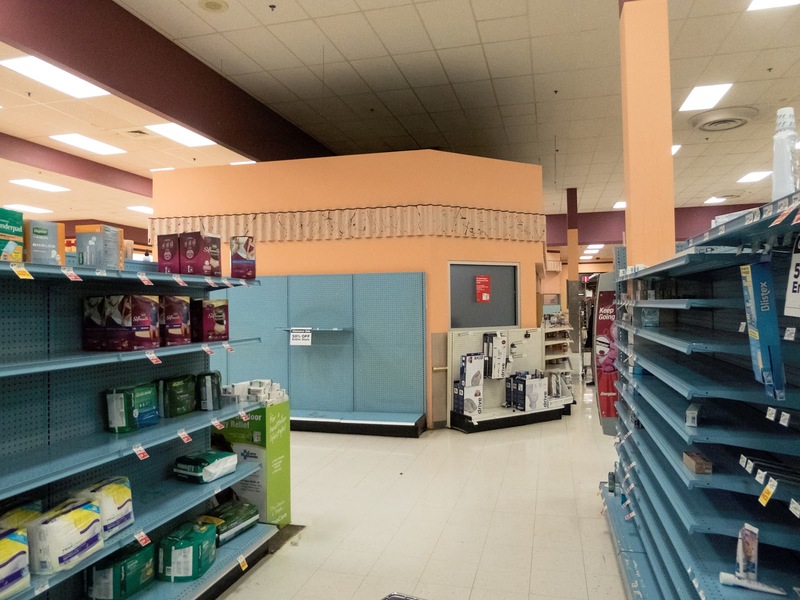 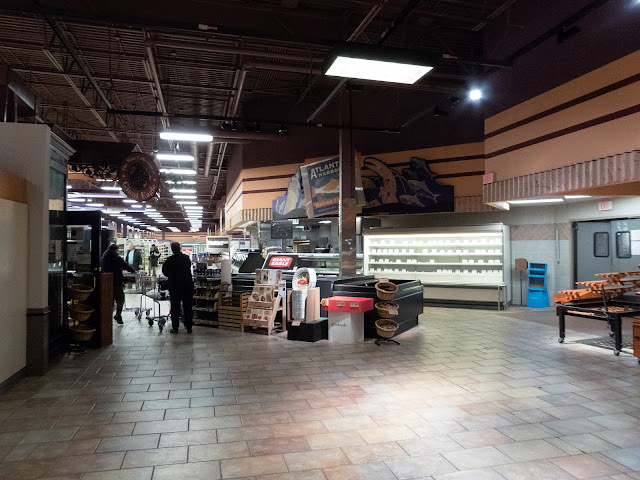 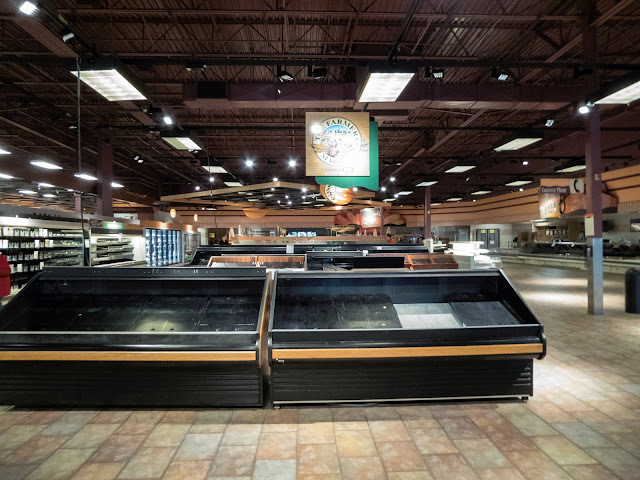 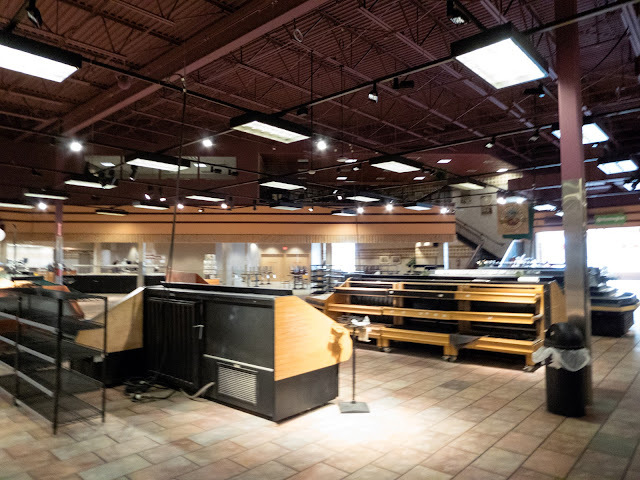 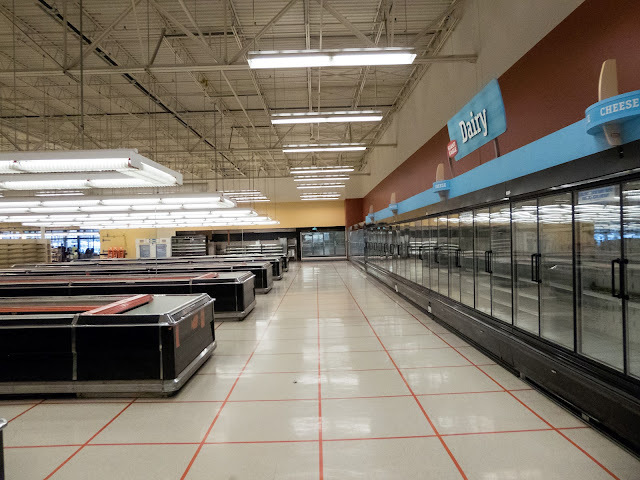 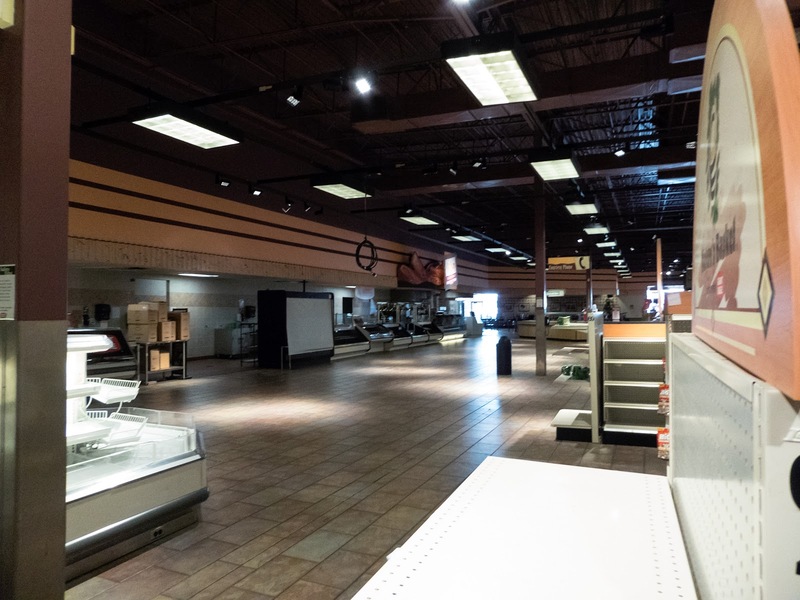 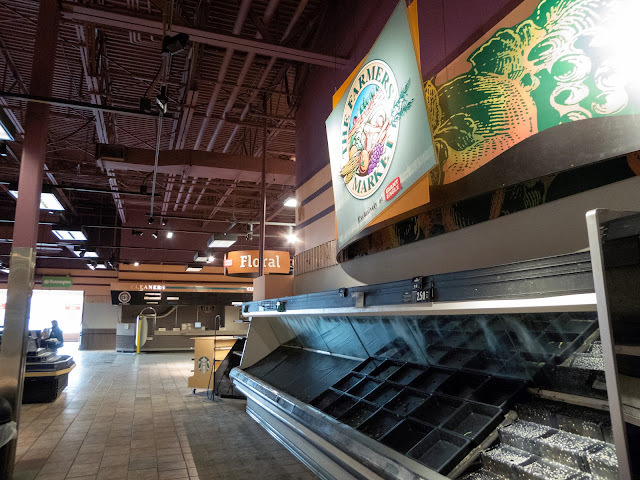 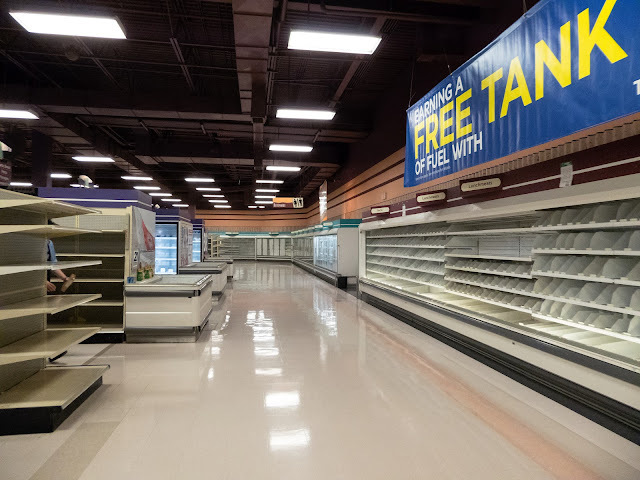 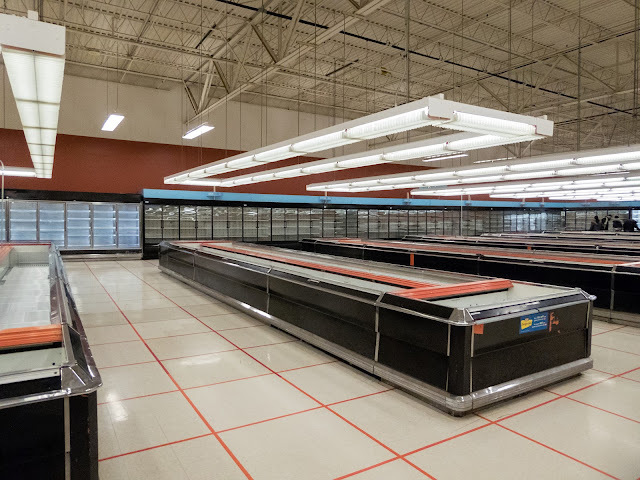 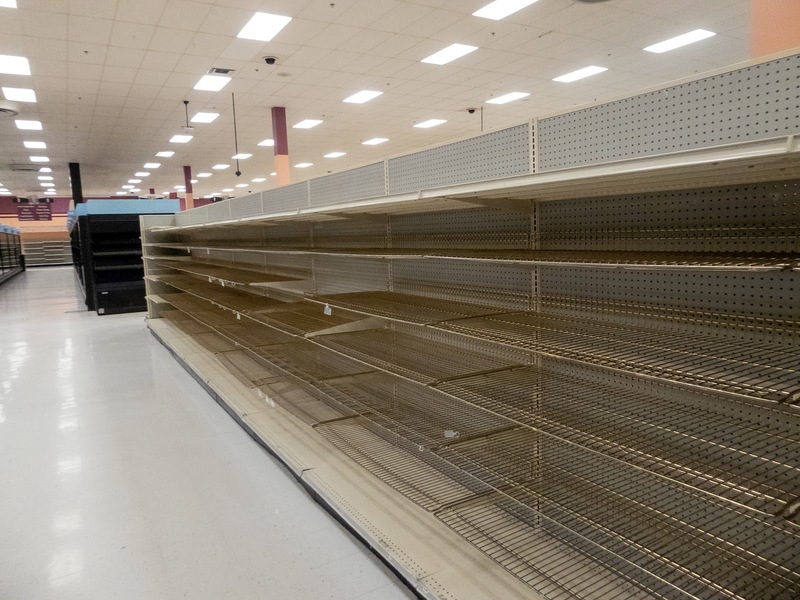 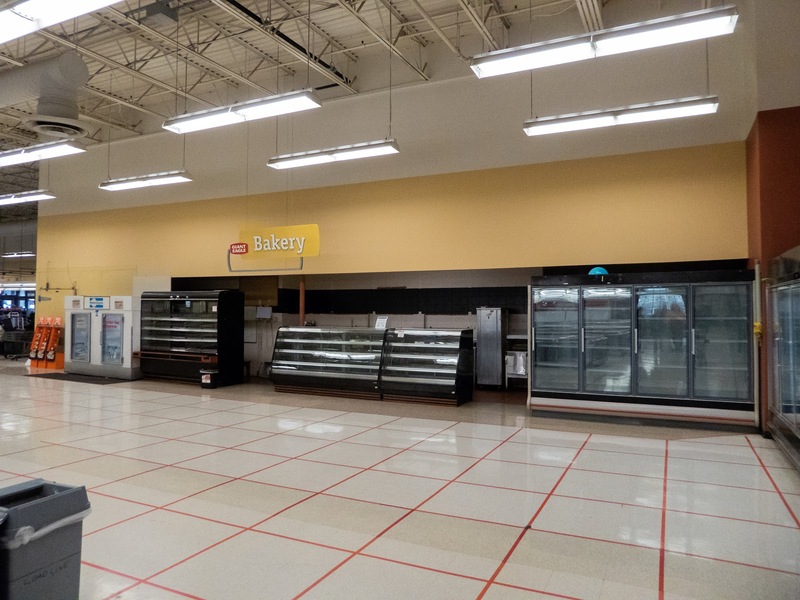 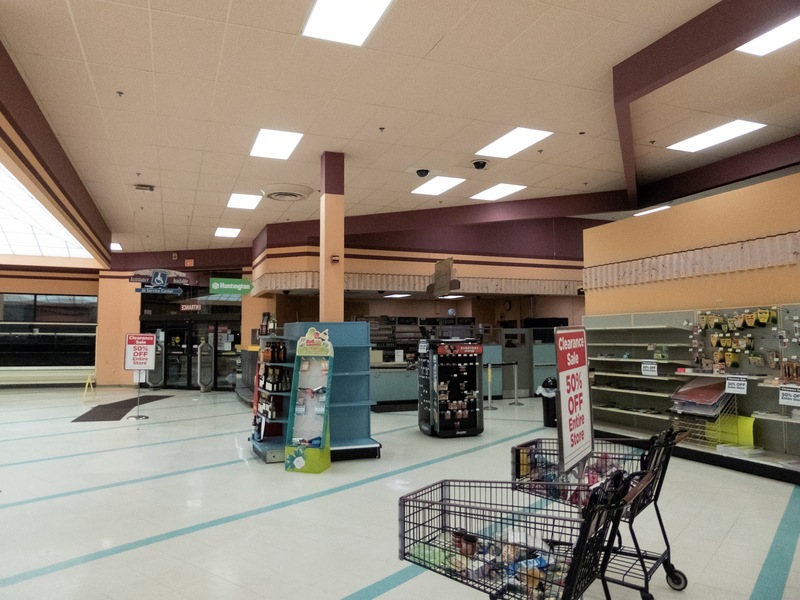 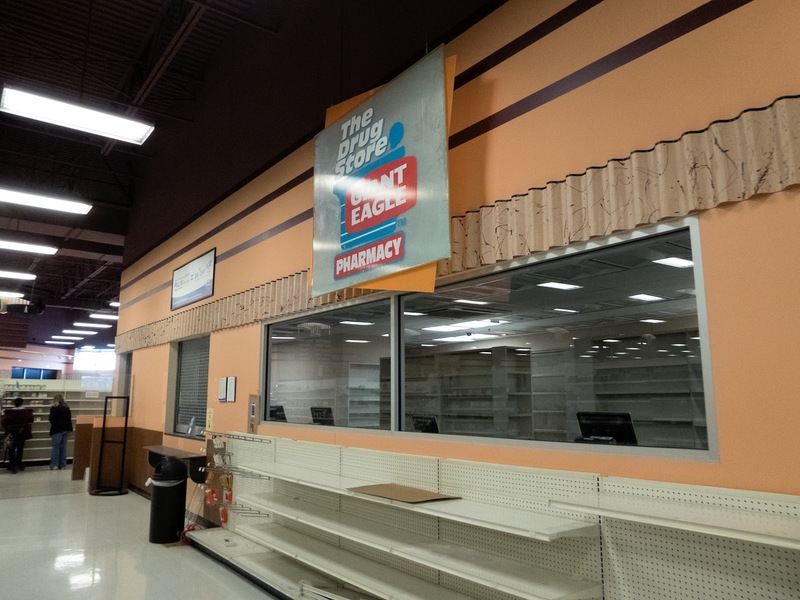 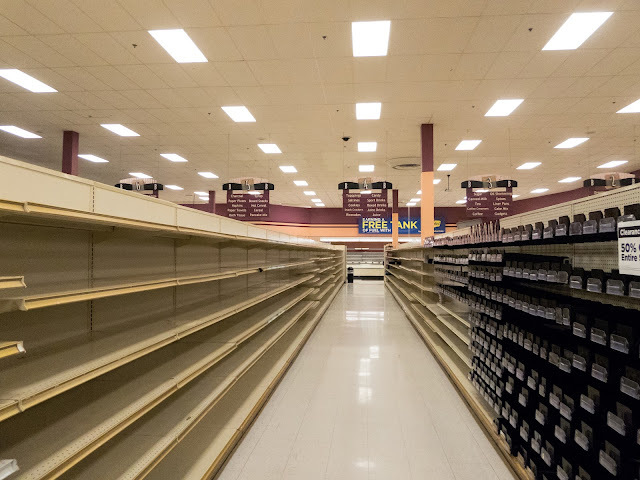 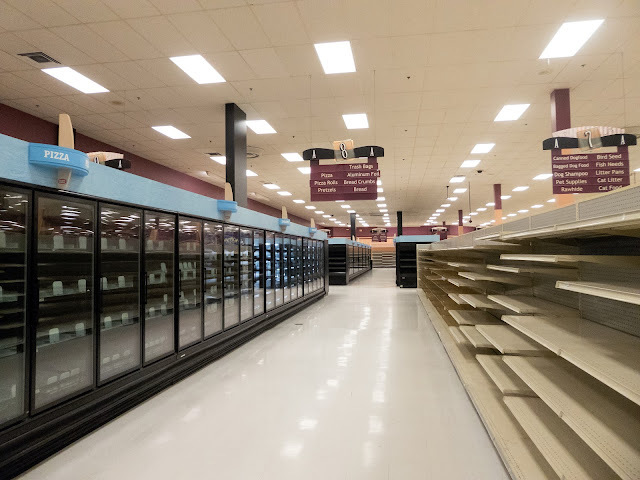 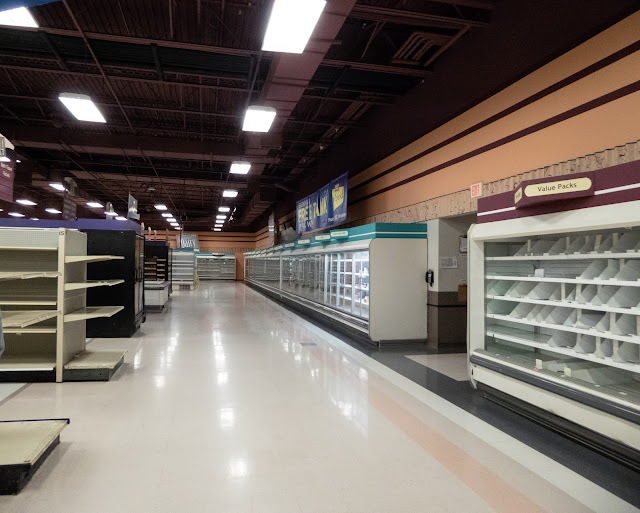 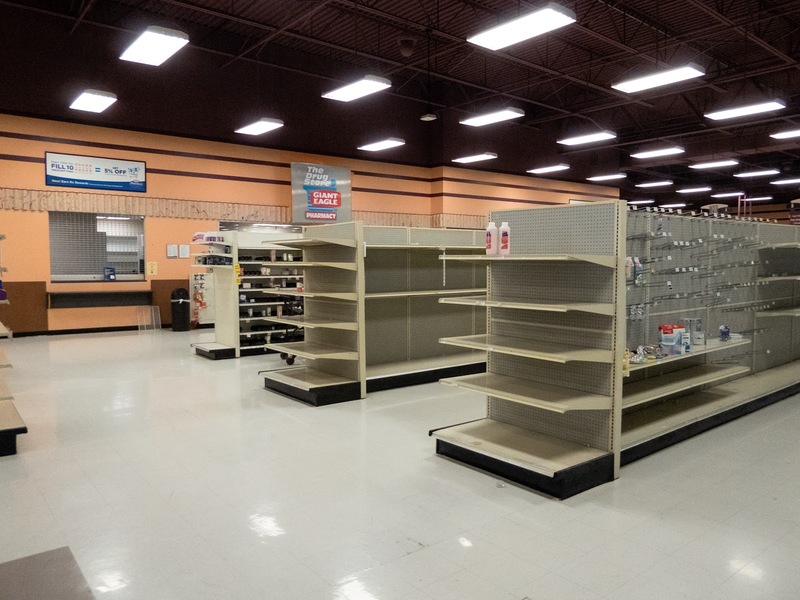 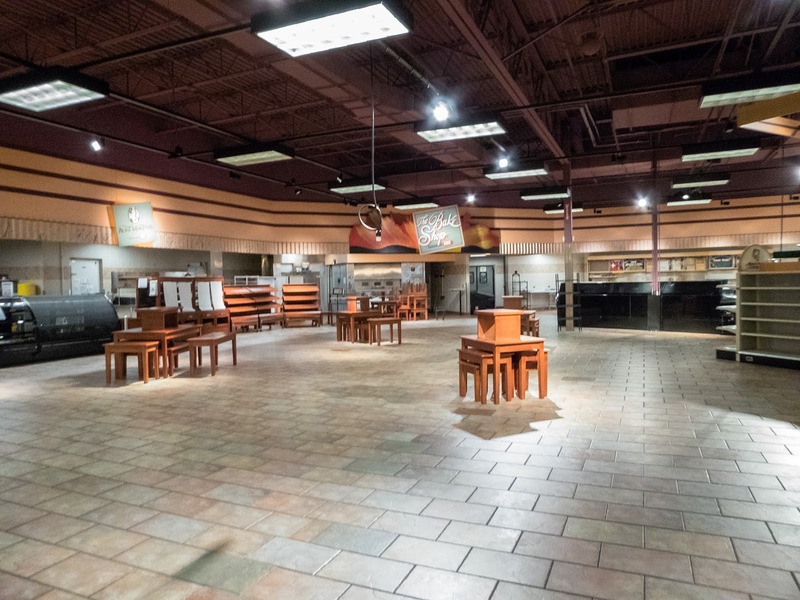 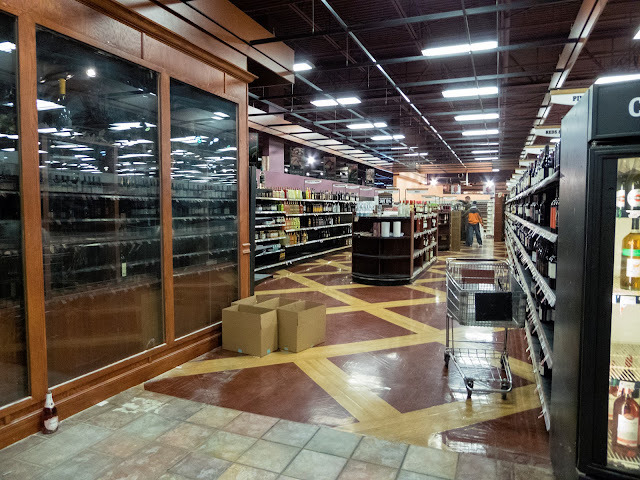 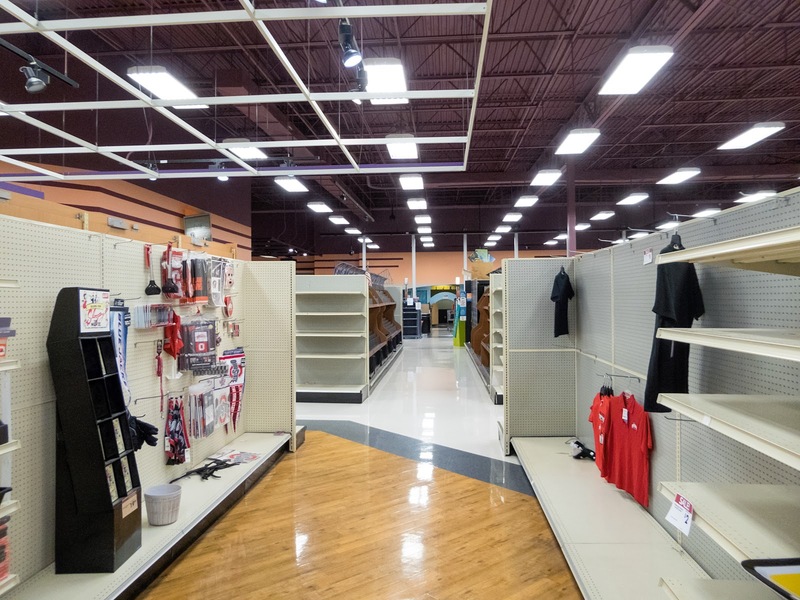 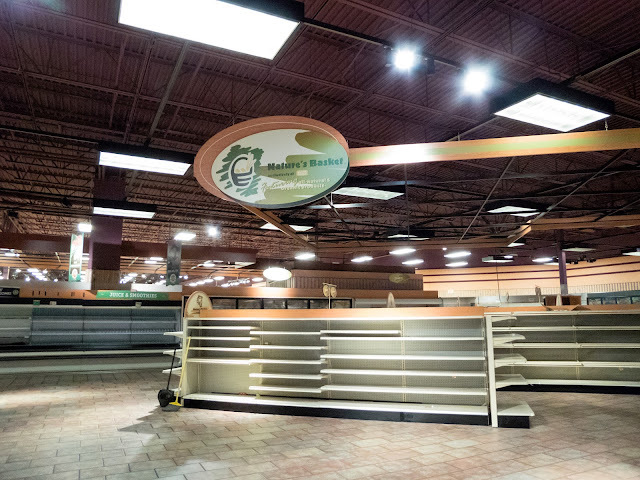 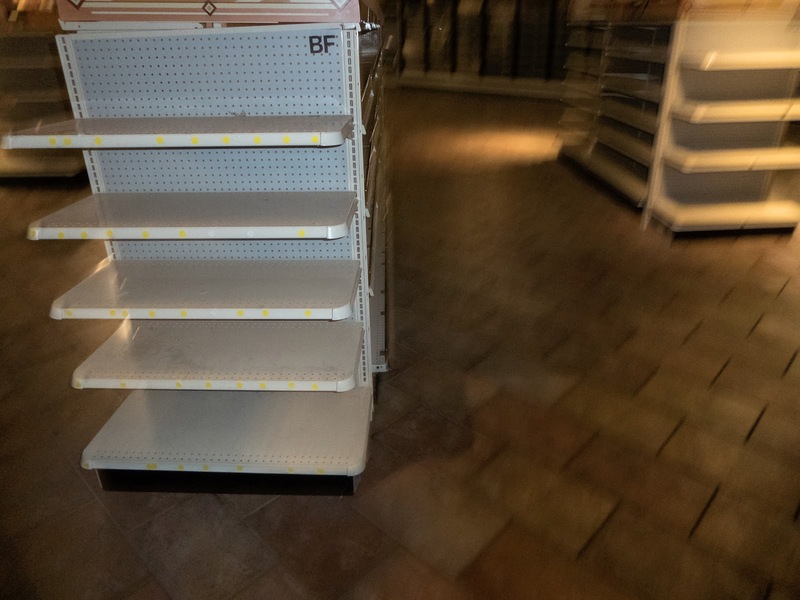 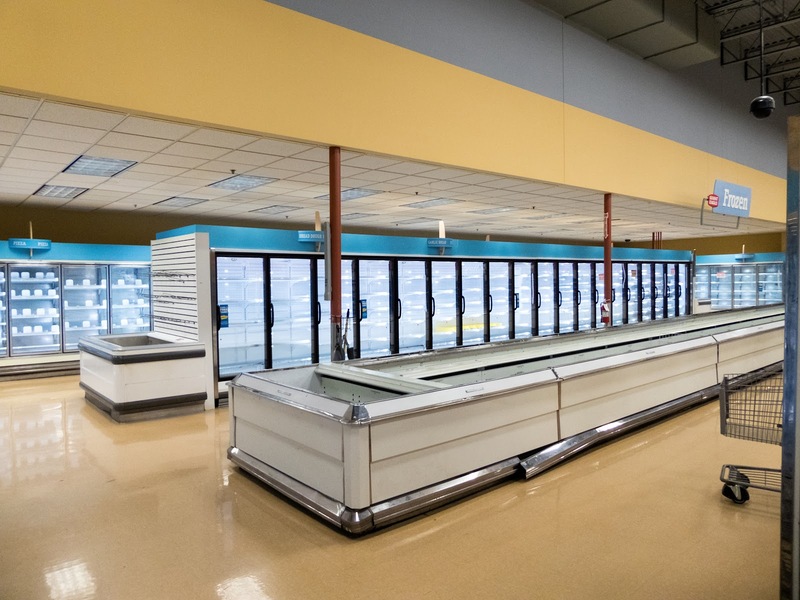 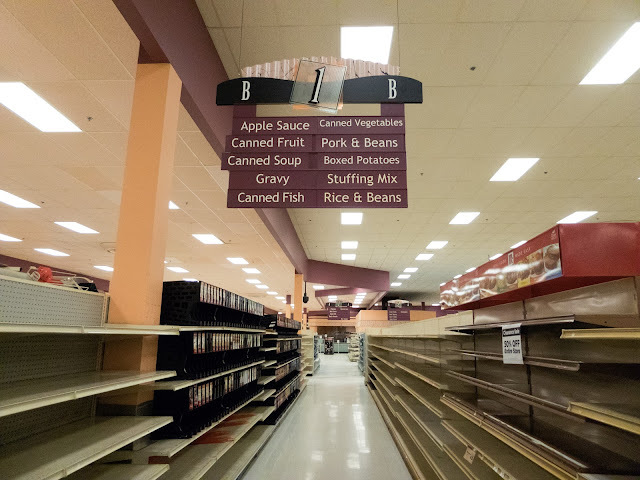 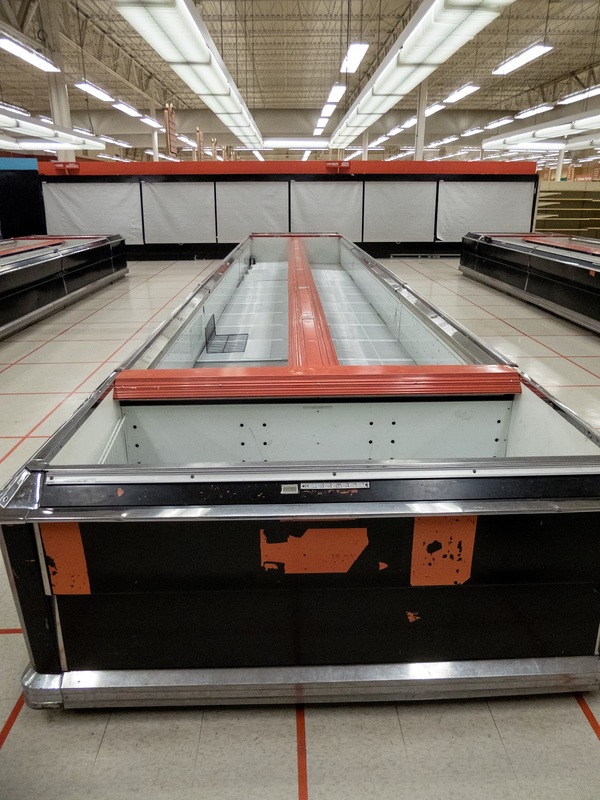 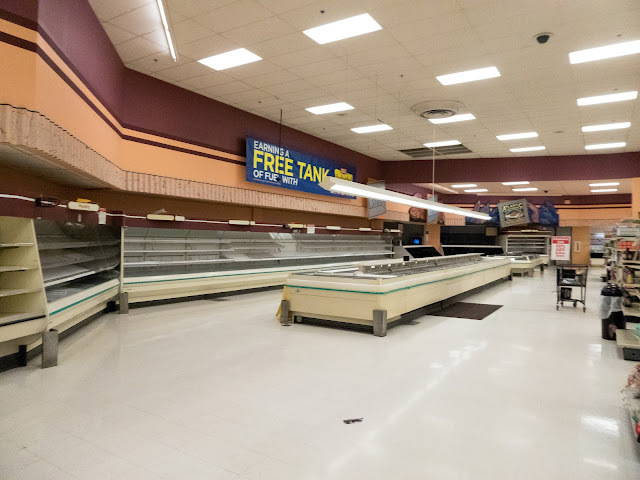 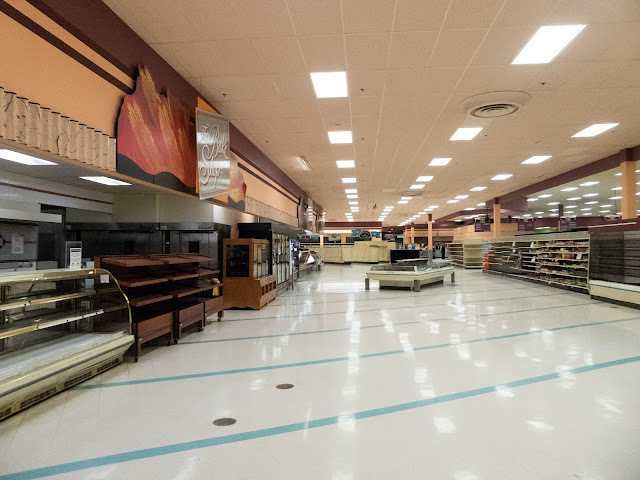 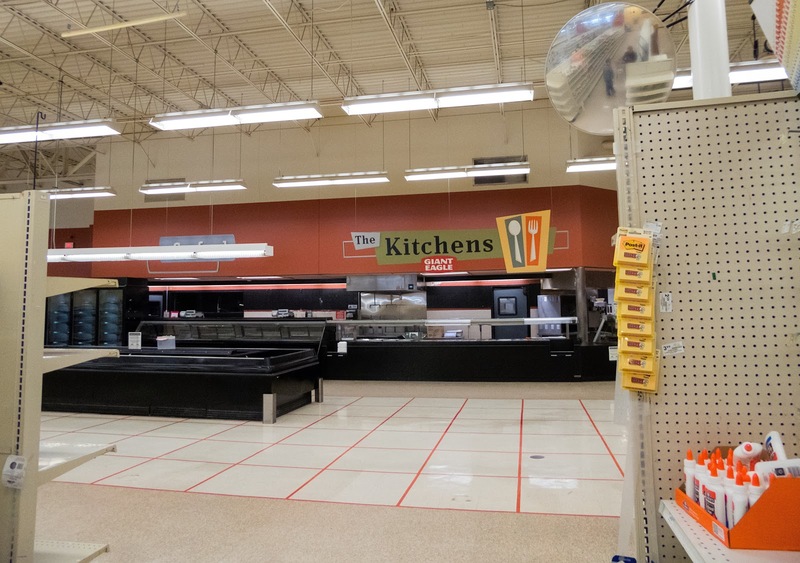 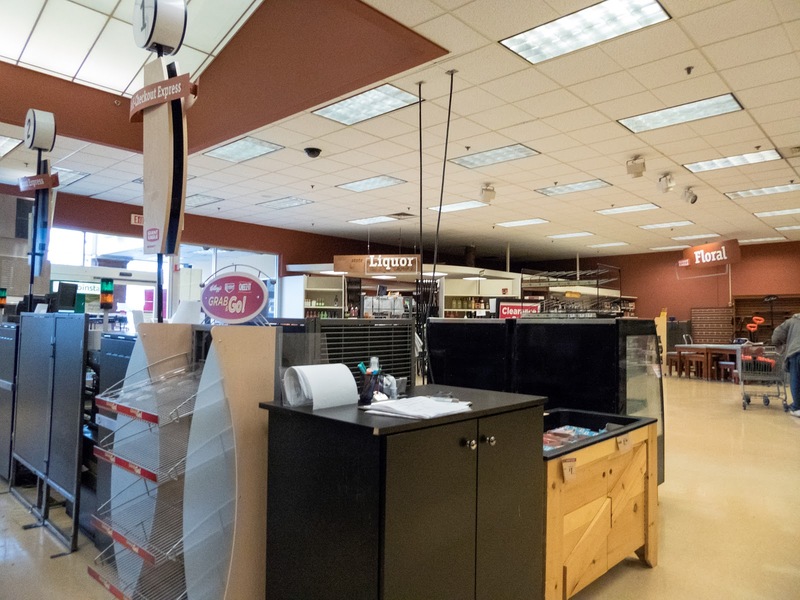 Giant Eagle has removed some of the lighting in some of the stores. 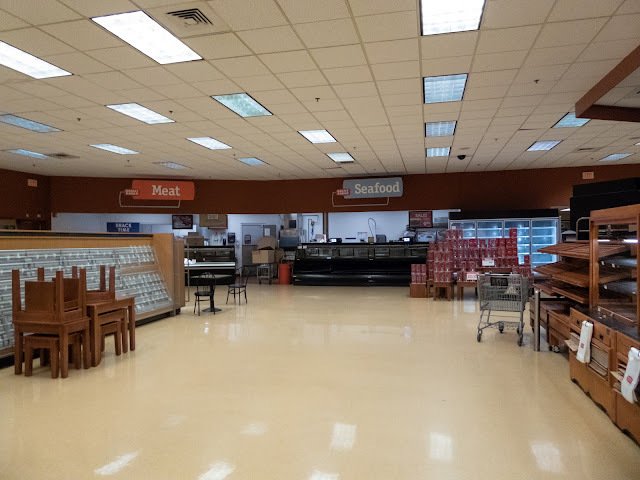 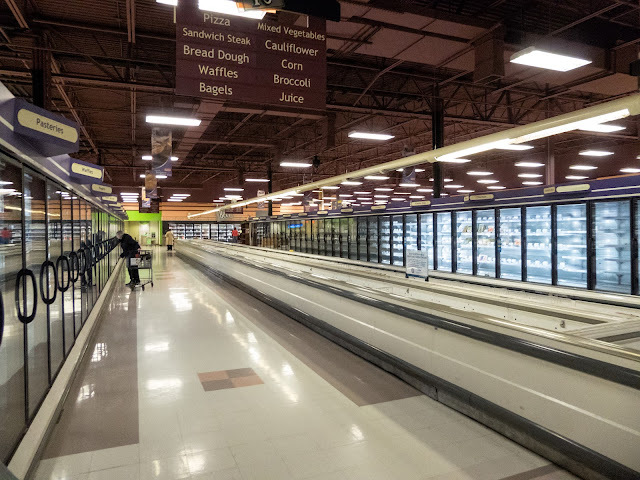 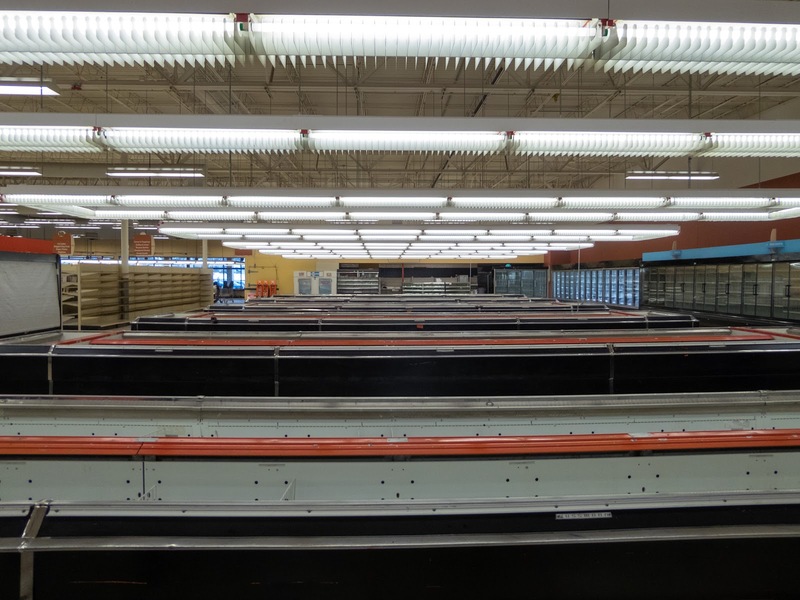 In some of those stores Giant Eagle has also painted the drop ceilings black or dark brown around the produce and put in spotlights. I like the look better with the older lights. 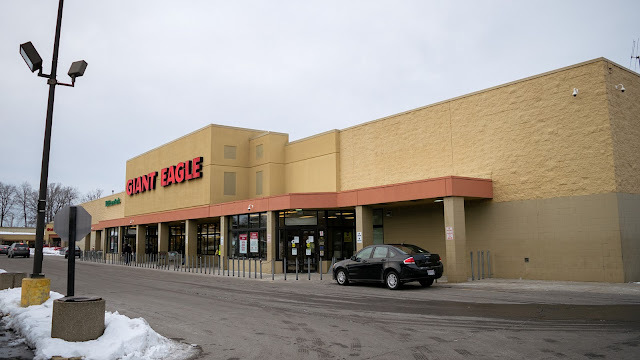 My favorite store was the Neil Avenue one in Columbus. 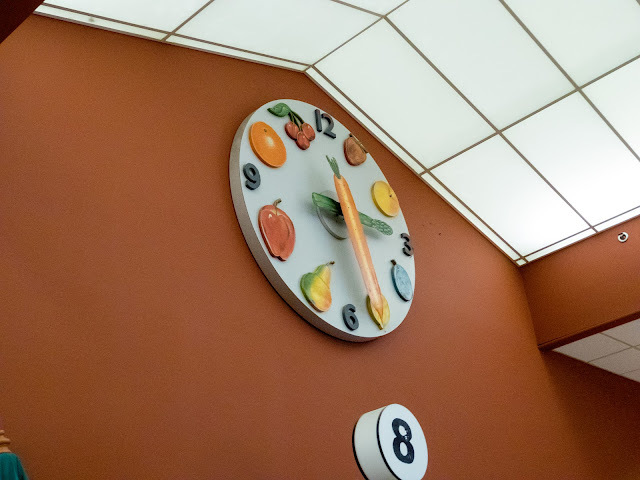 It was neat that they still had a Big Bear clock in use. 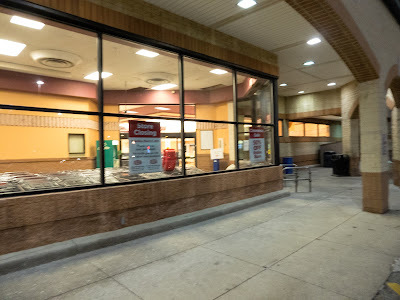 The interior was still very Big Bear like despite being painted and having new signs put in. 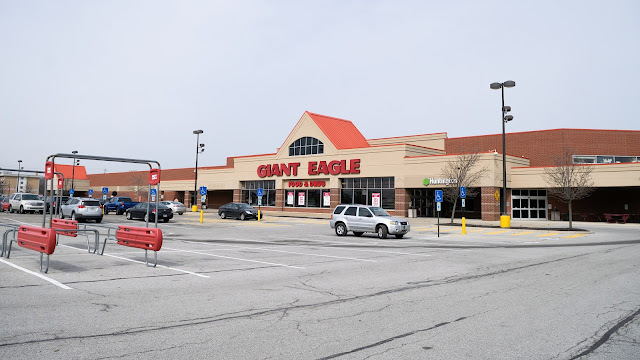 The East Dublin Granville (OH-161) was the first Giant Eagle I went to several years back. 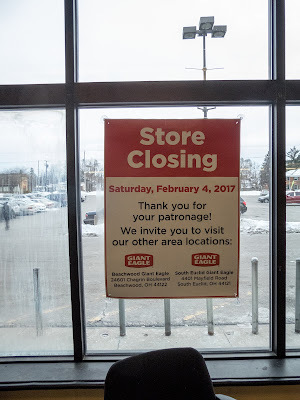 Too bad it is closed now, but that area is very empty, filled will closed stores.